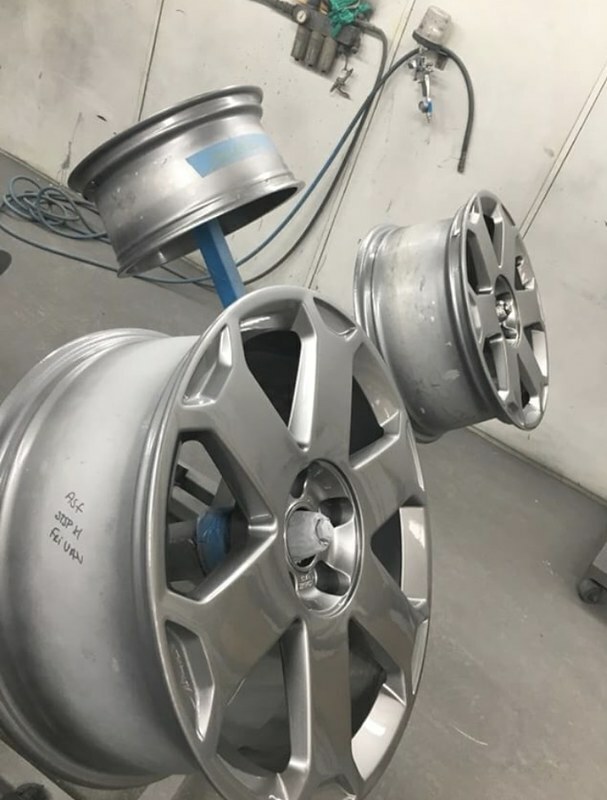 Nice job on the tips - I bet it was satisfying popping those back on. 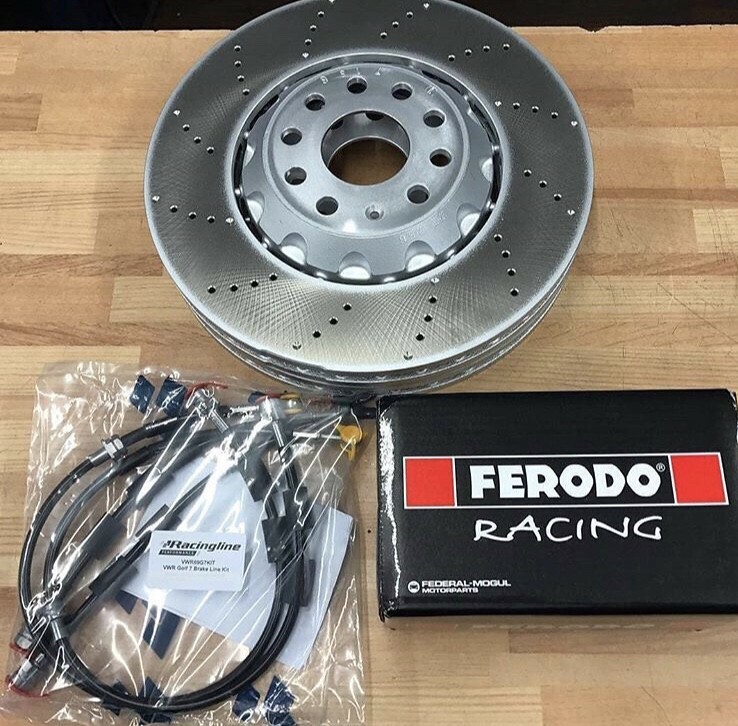 So made the trip to tps today to pick up a number of different parts. 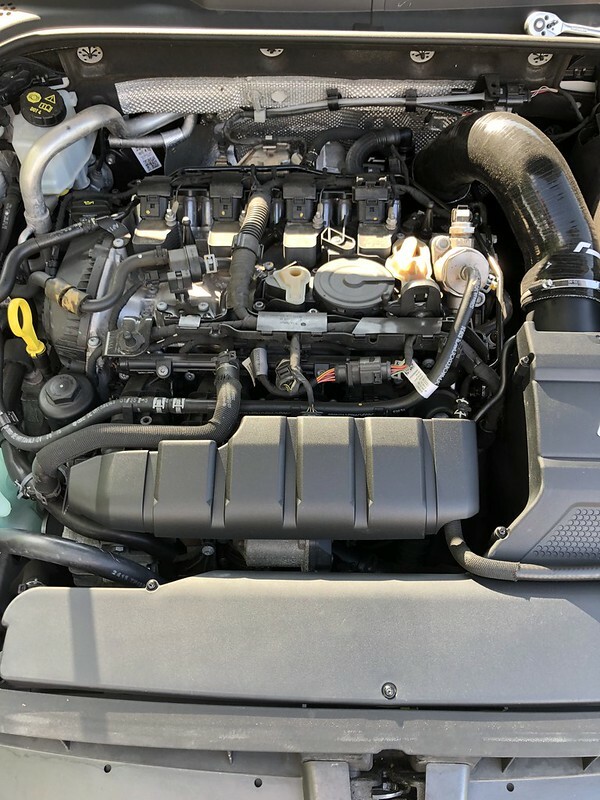 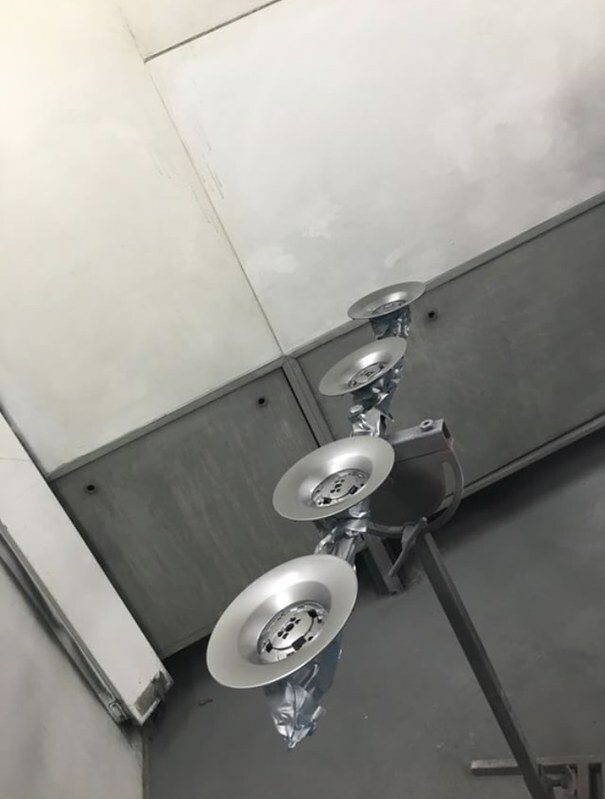 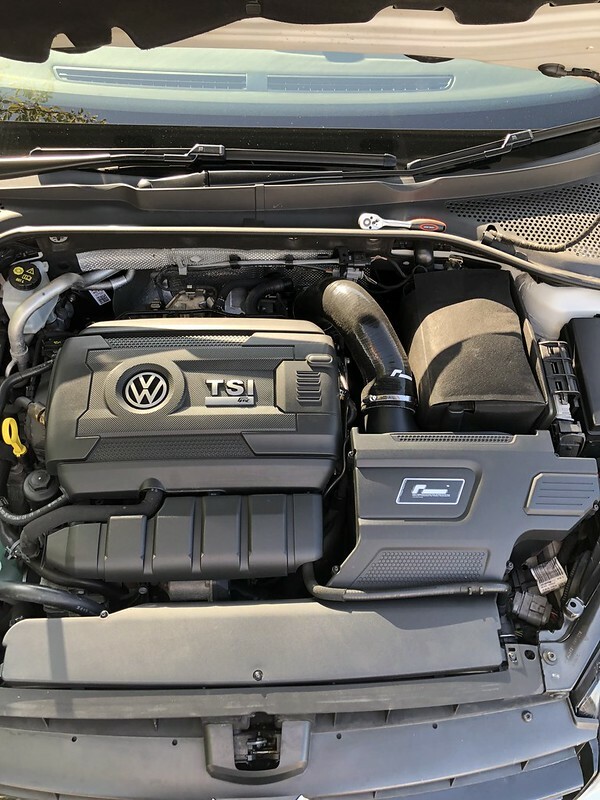 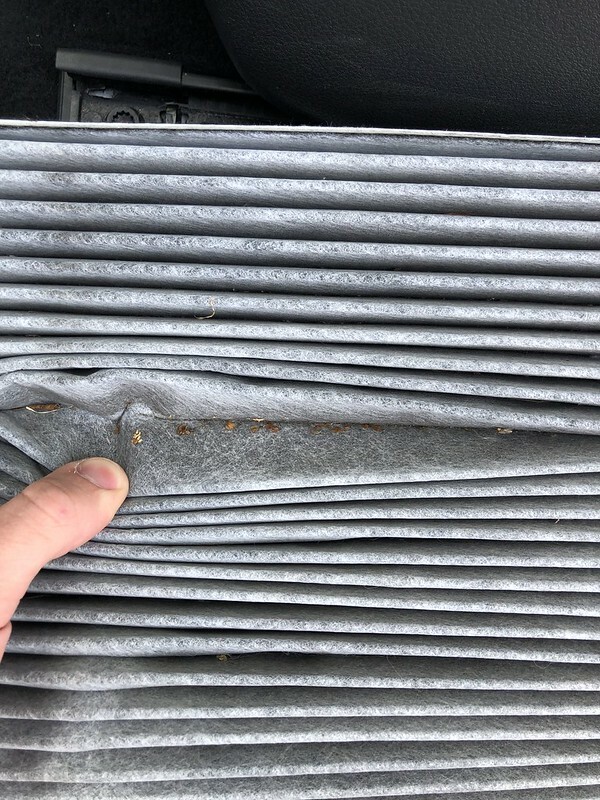 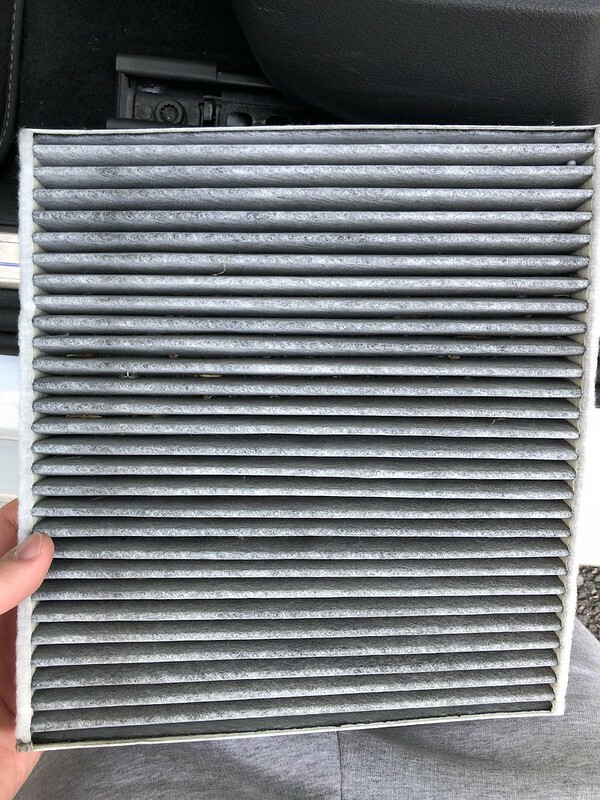 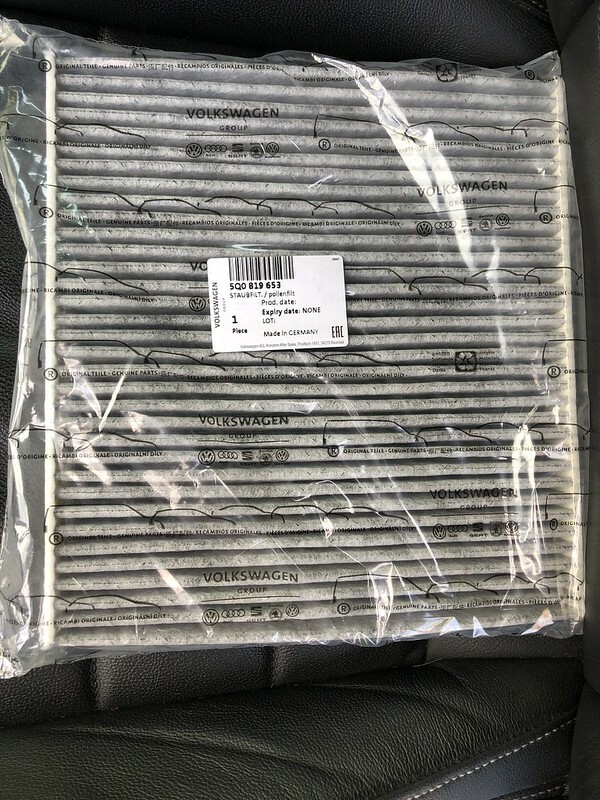 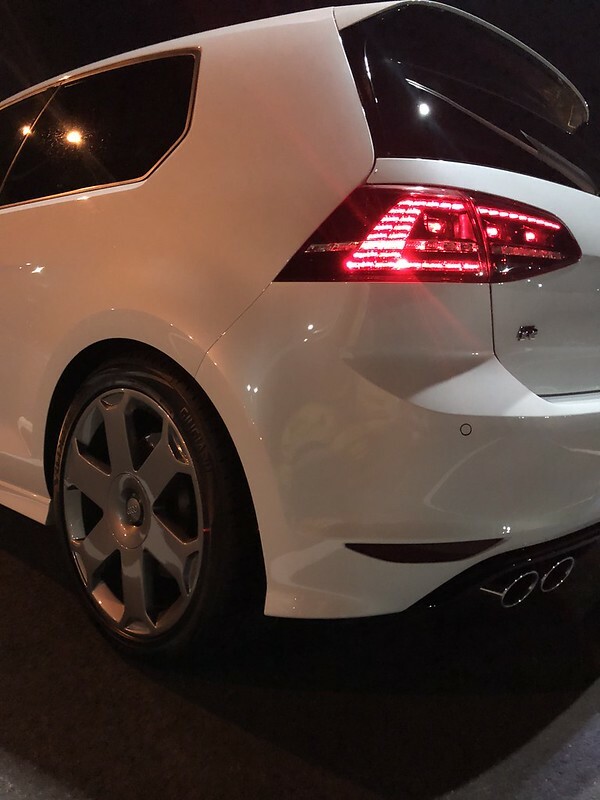 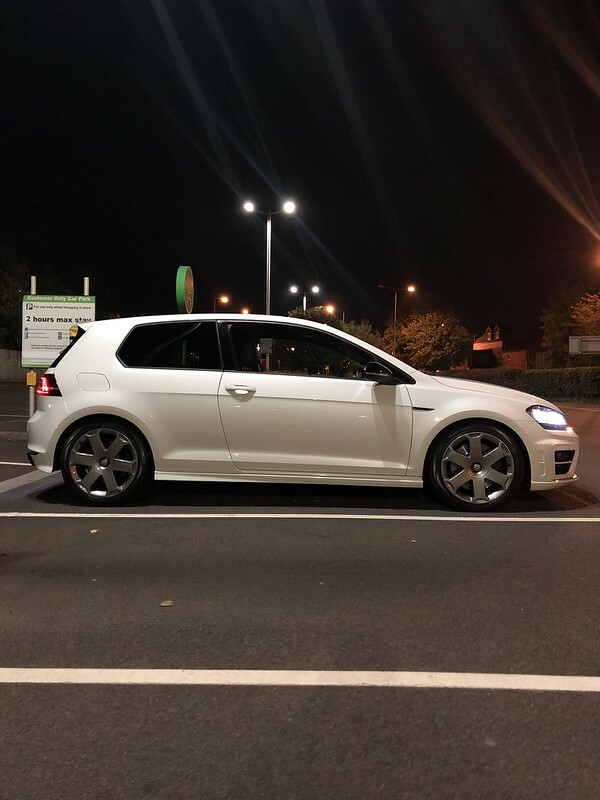 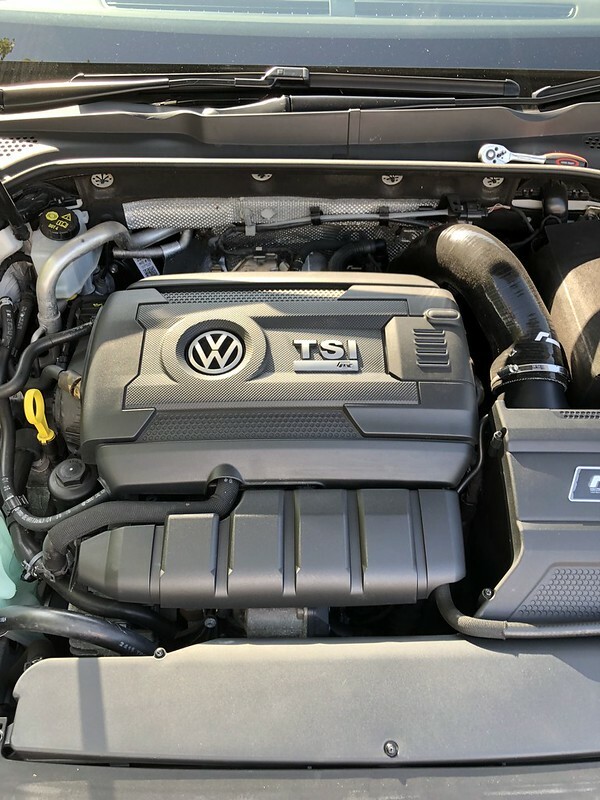 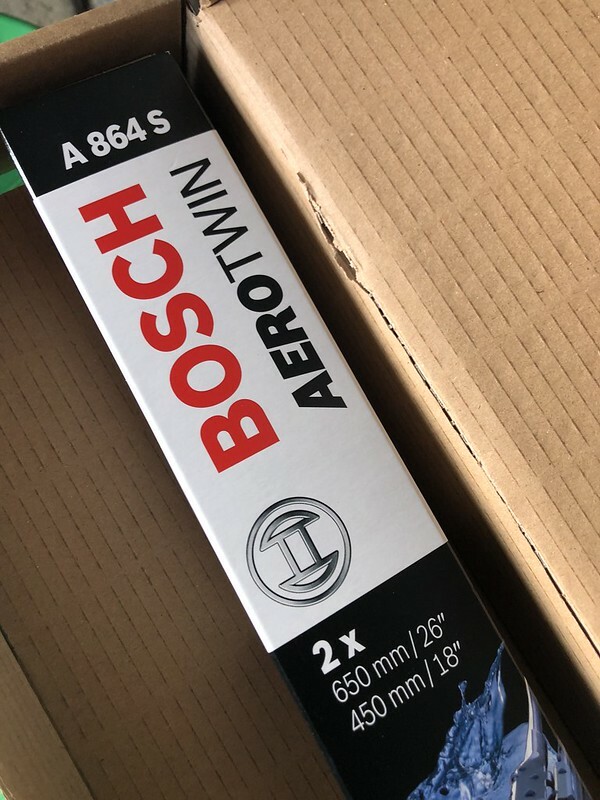 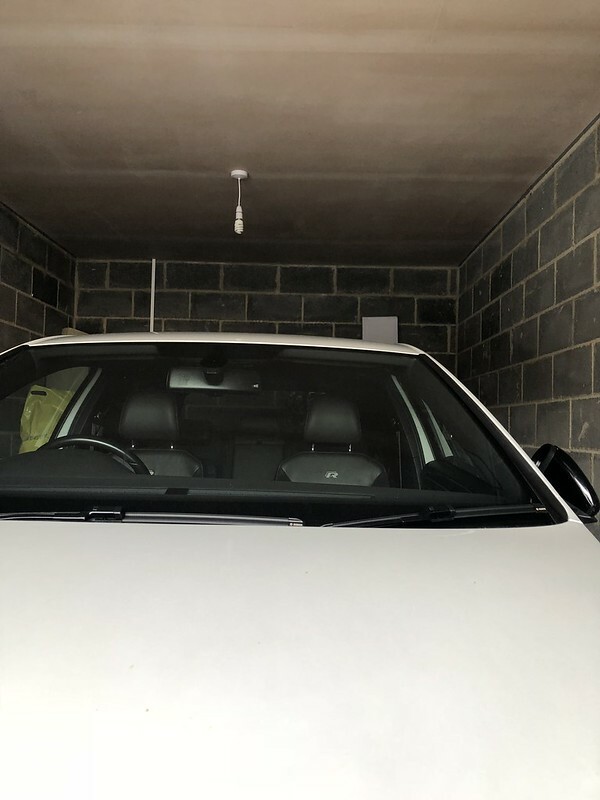 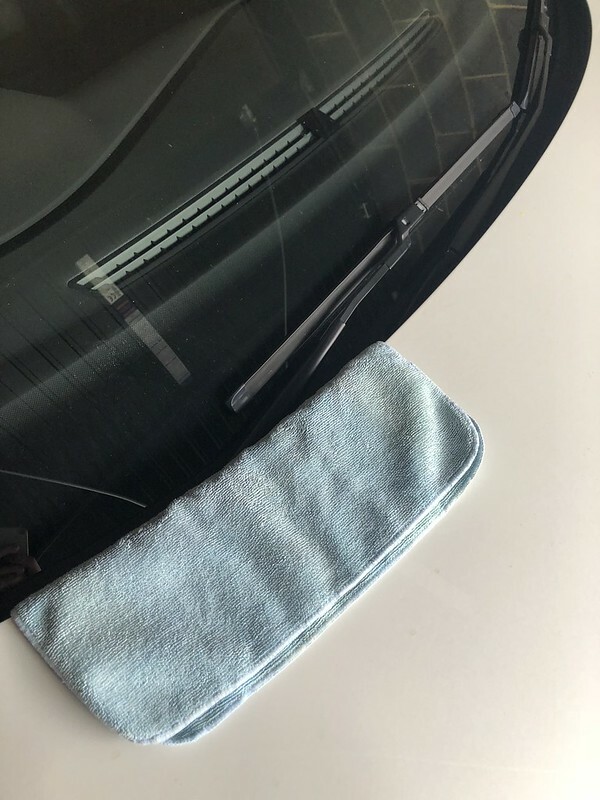 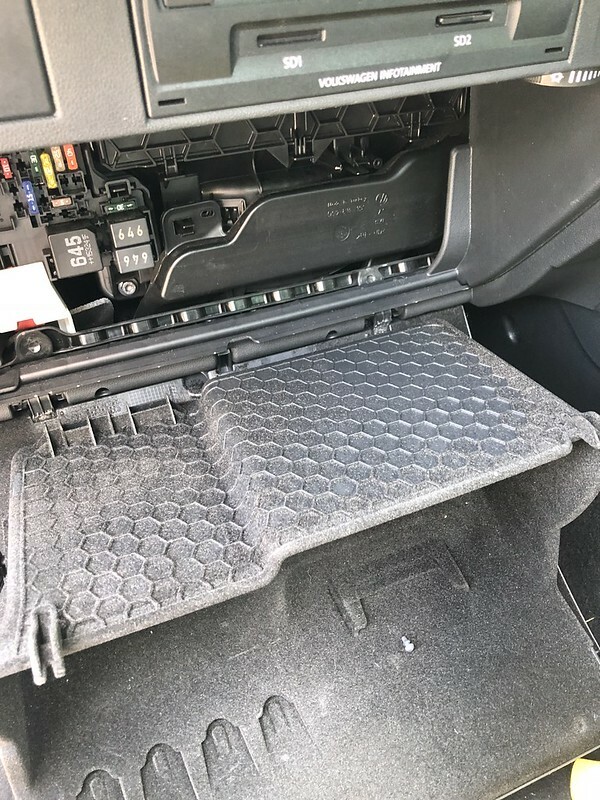 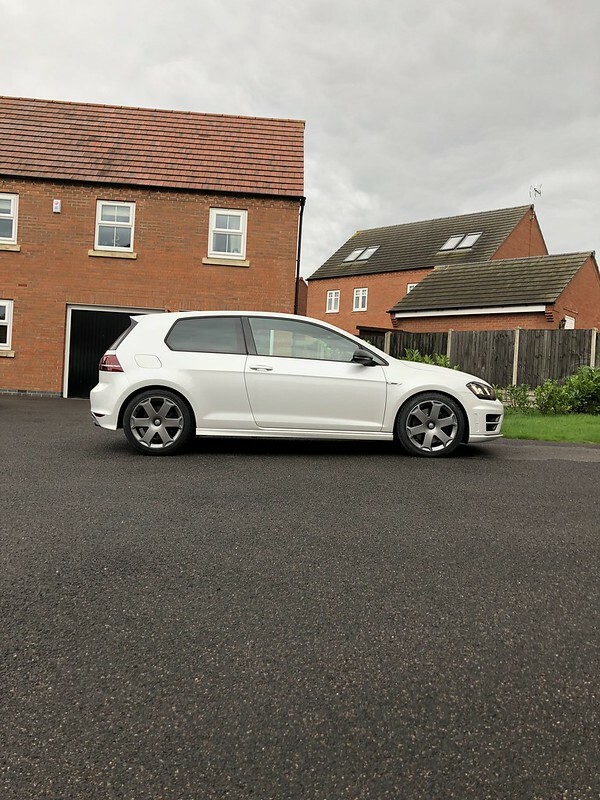 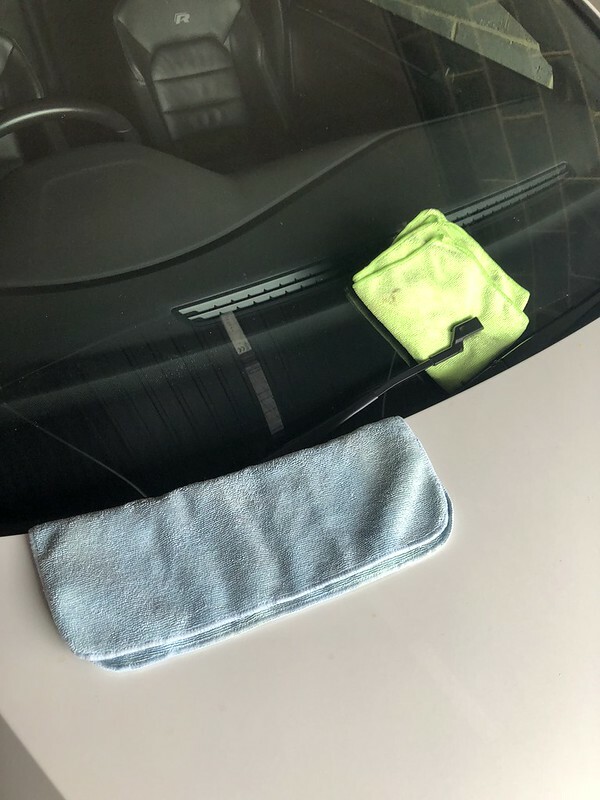 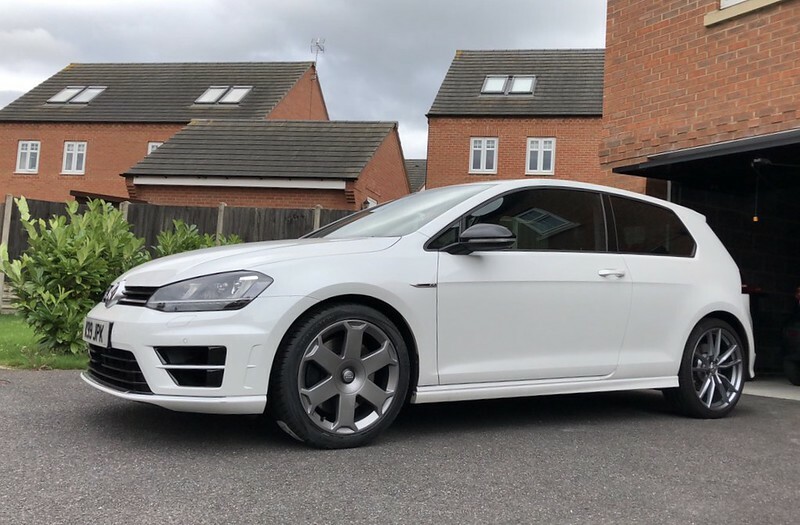 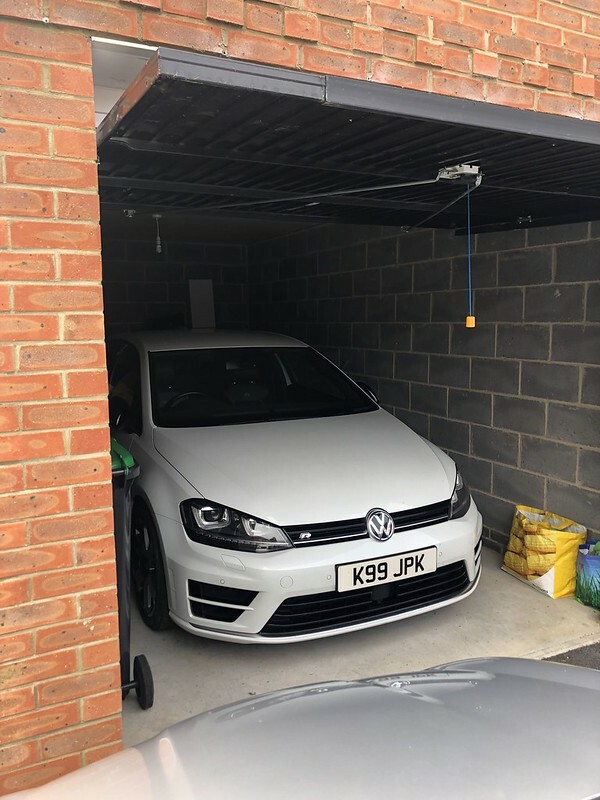 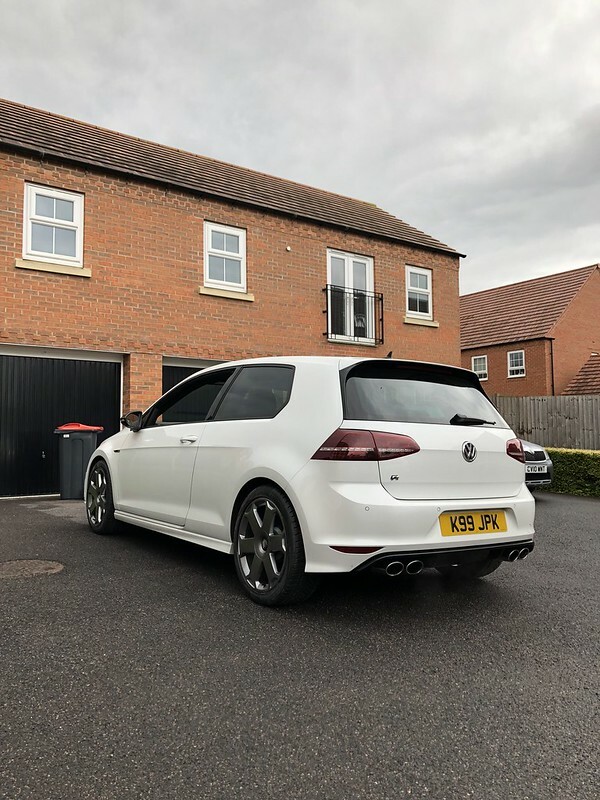 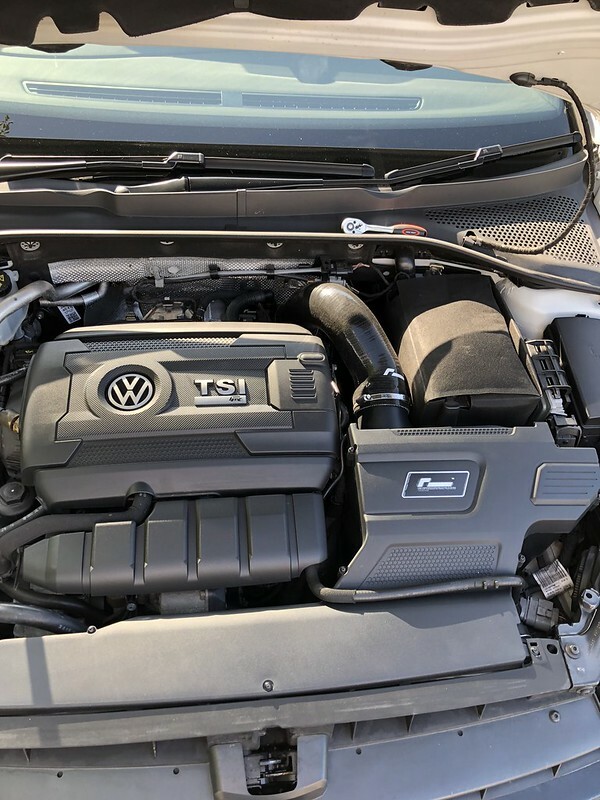 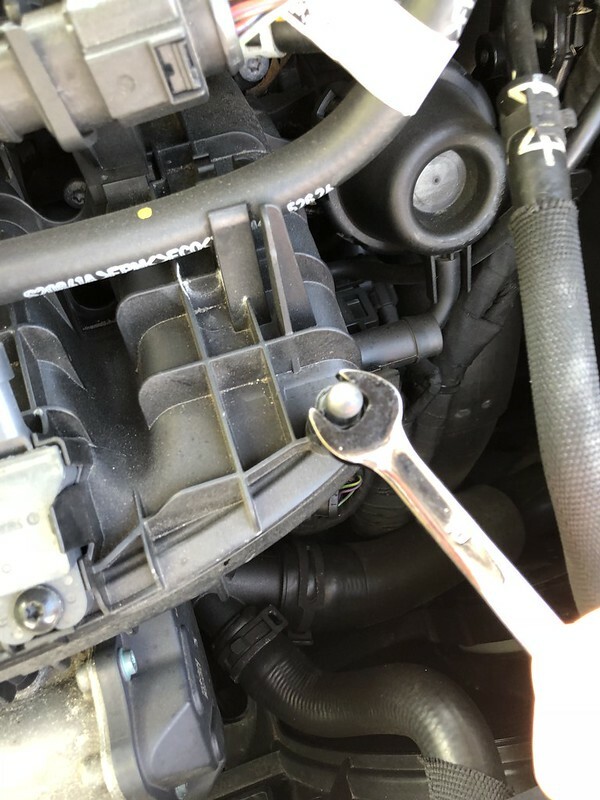 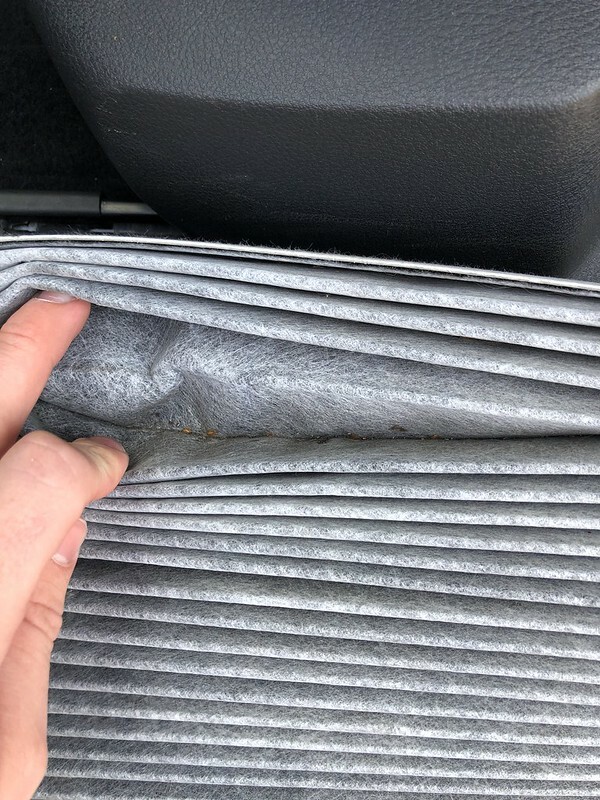 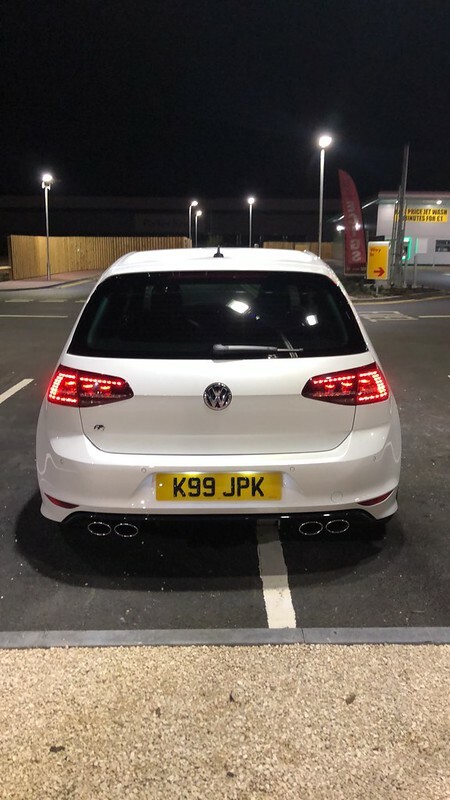 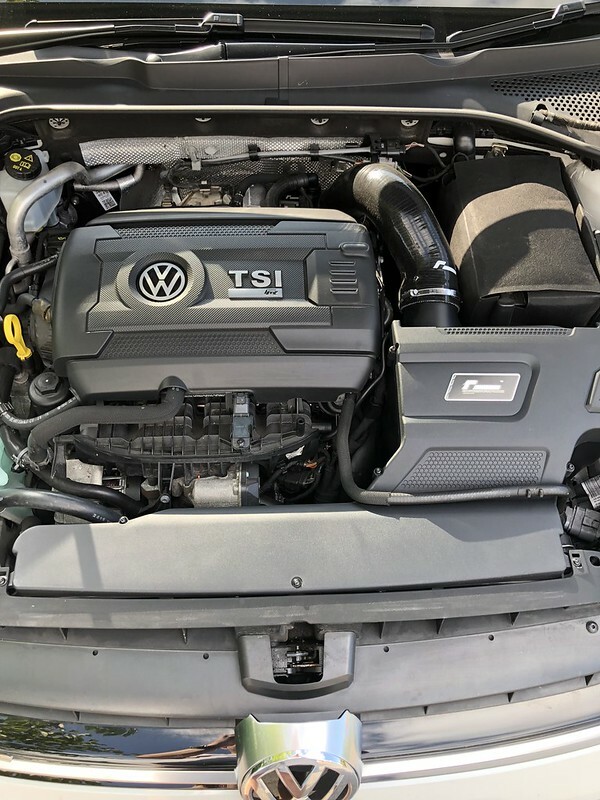 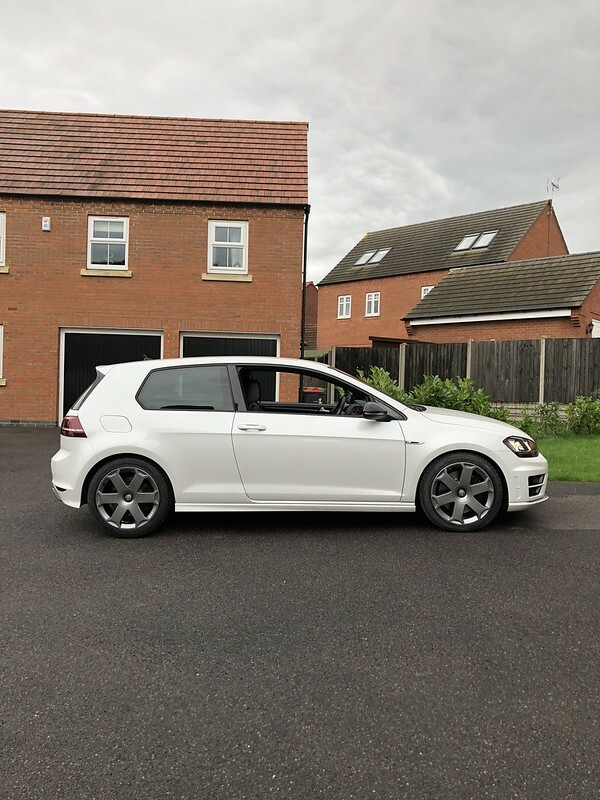 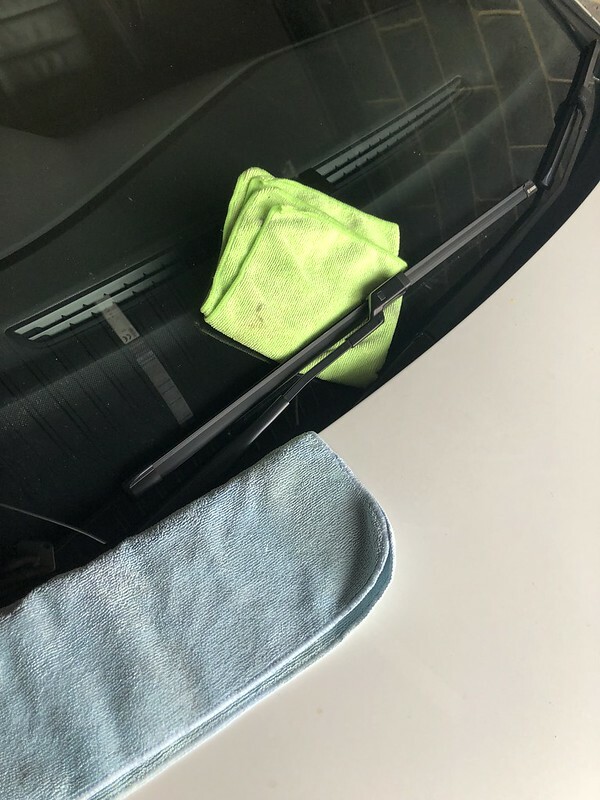 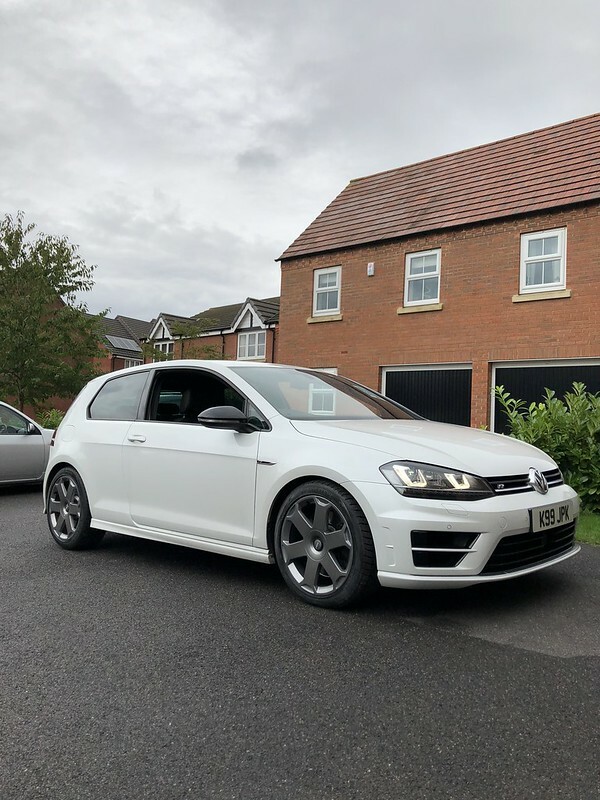 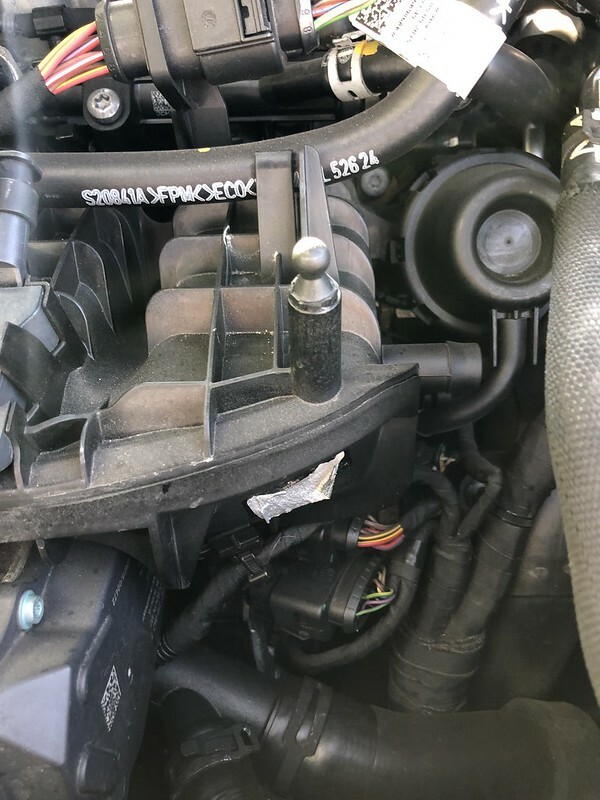 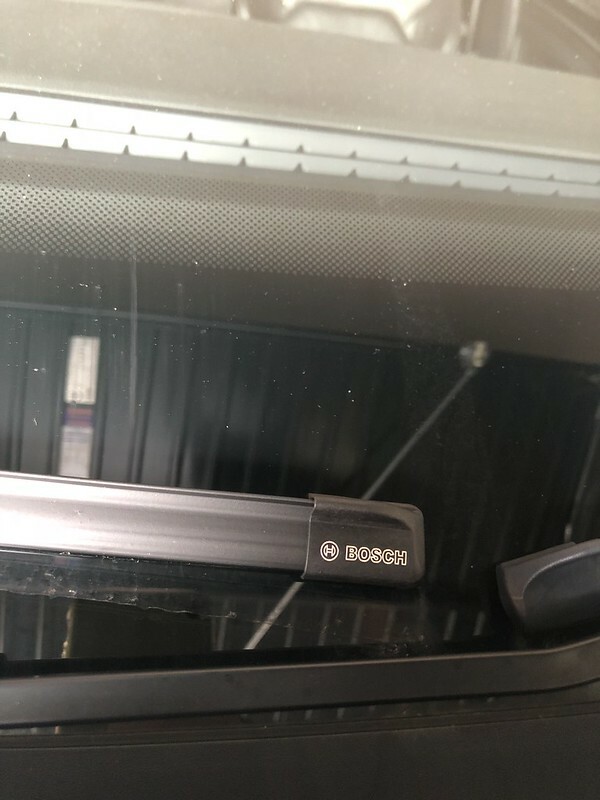 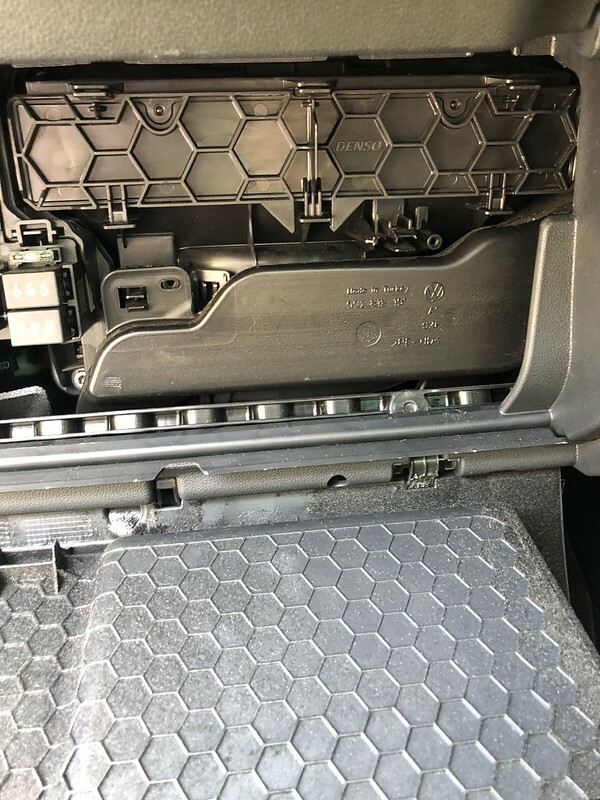 The car was serviced at the end of June at VW as its still under manufactures warranty, they performed an oil service and pollen filter change. 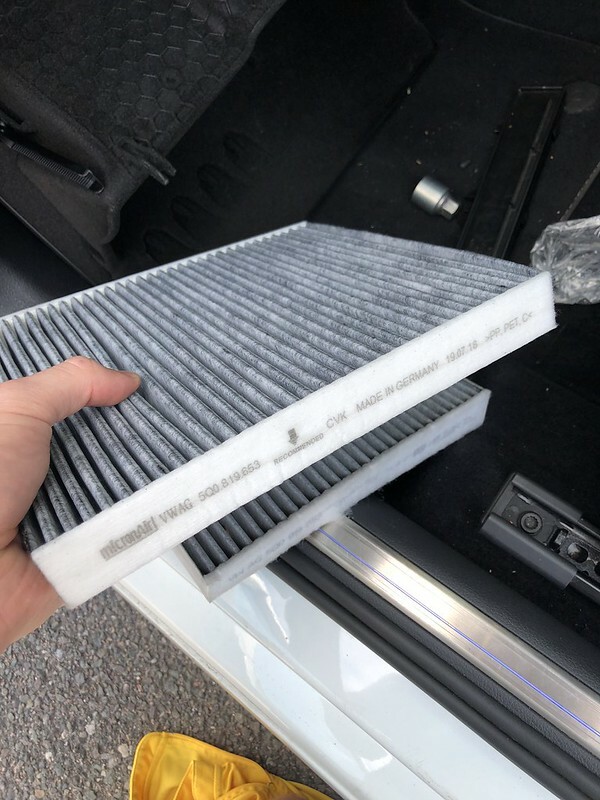 Having looked at the pollen filter i'm not sure it was changed so popped a new one in today for peace of mind. 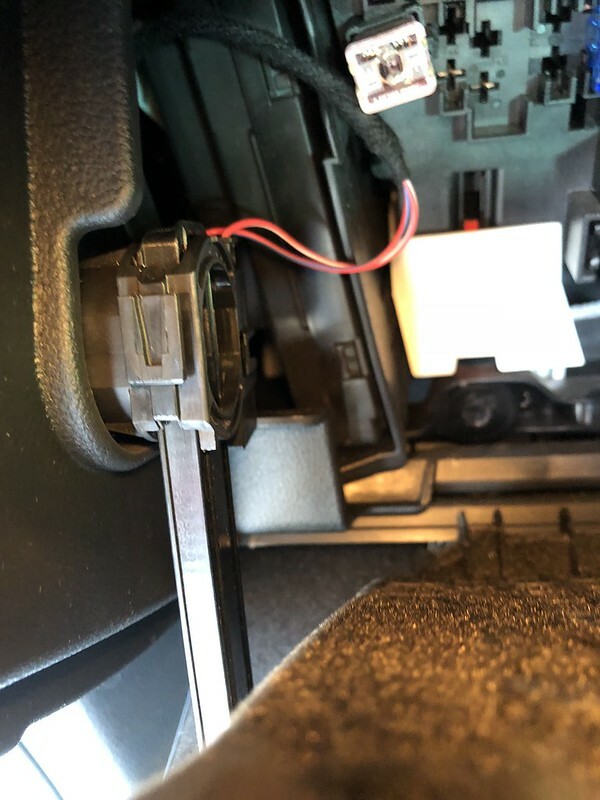 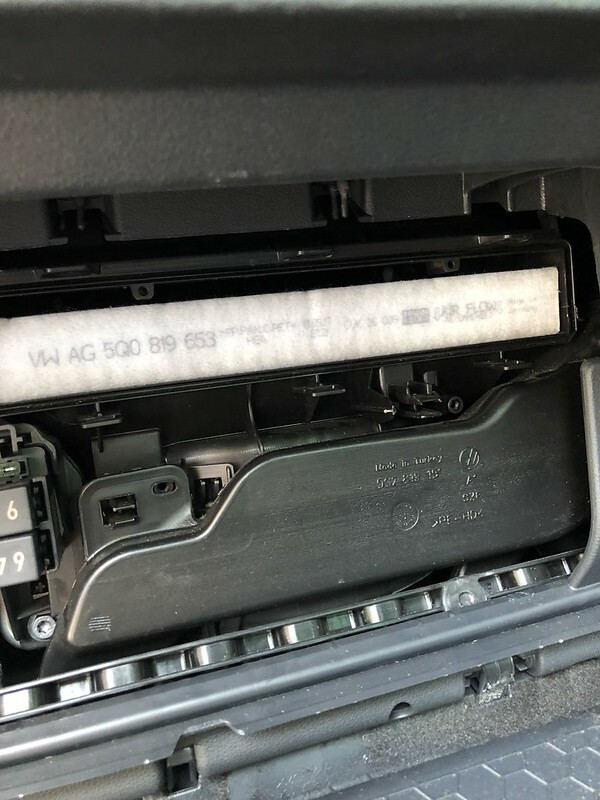 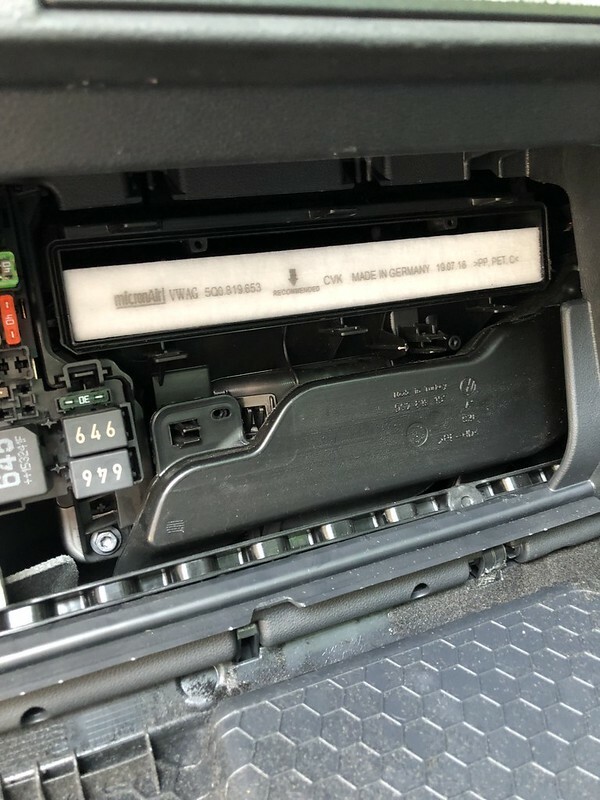 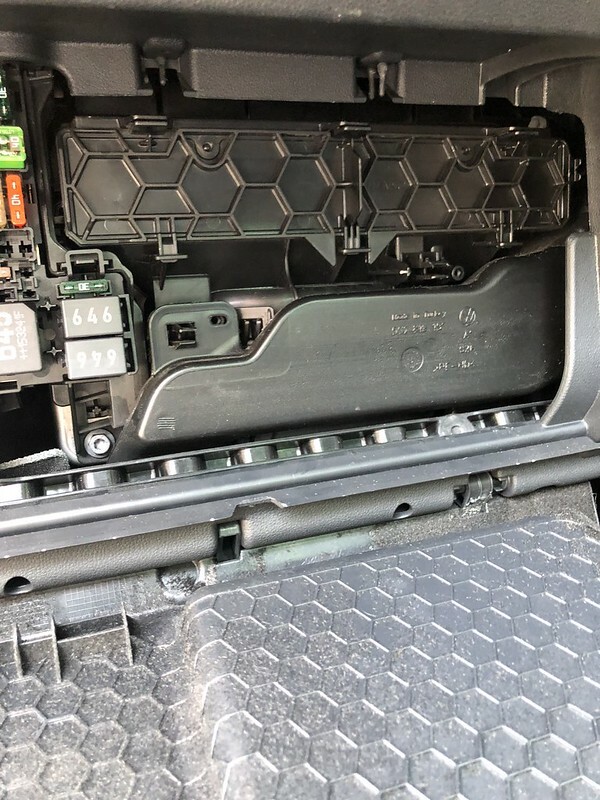 To get to the filter you have to open the glovebox, theres two buttons at the top that you push inwards and the glovebox releases down. 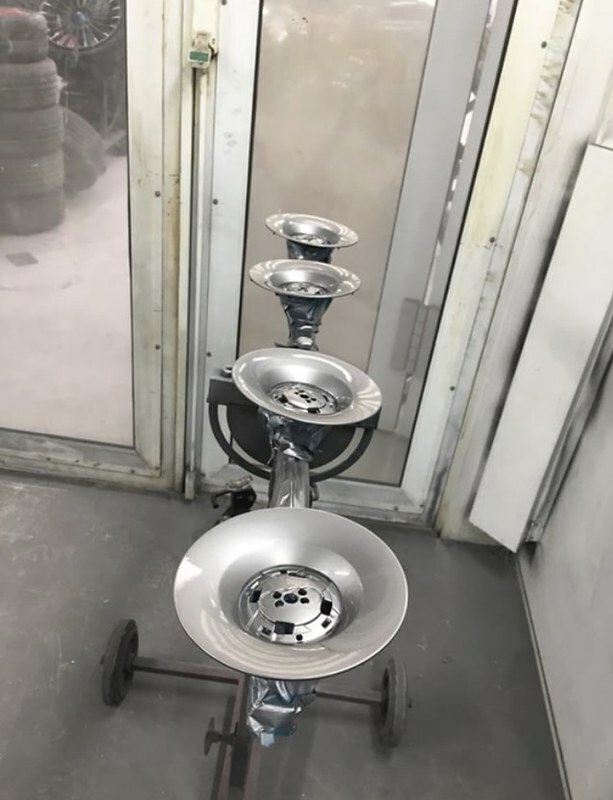 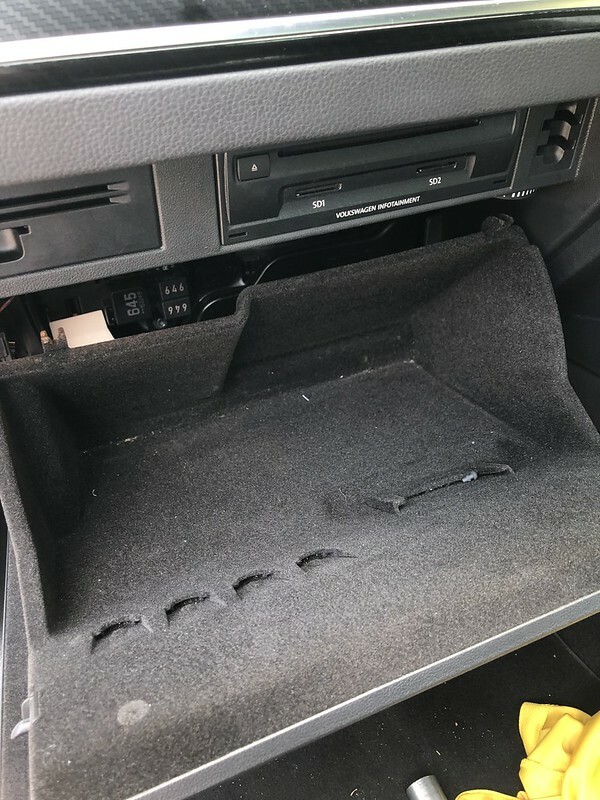 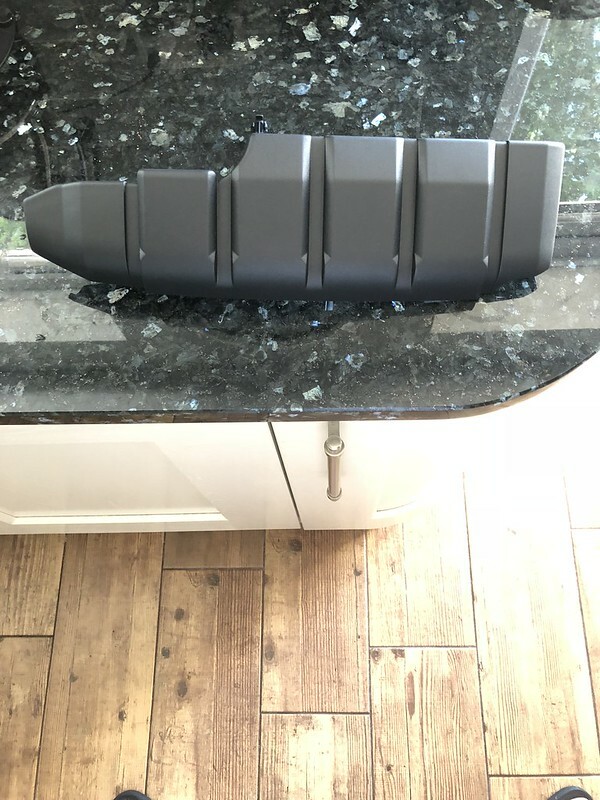 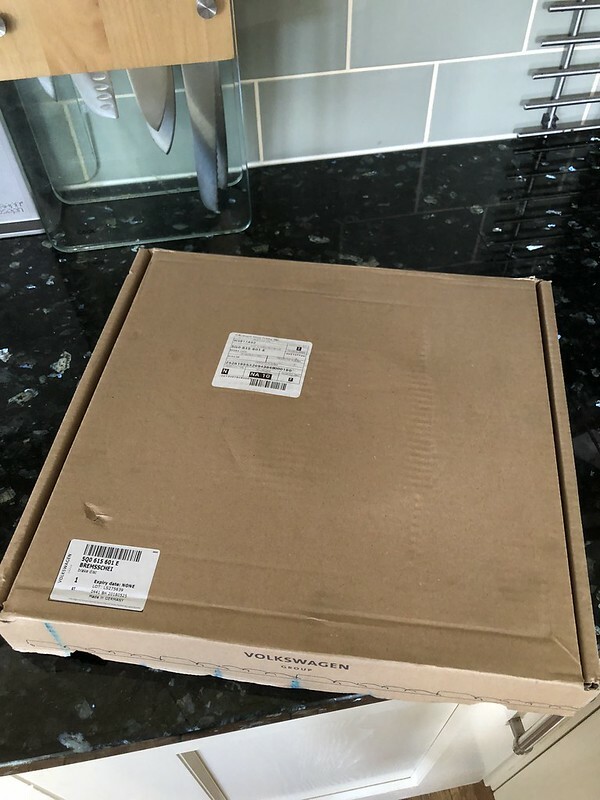 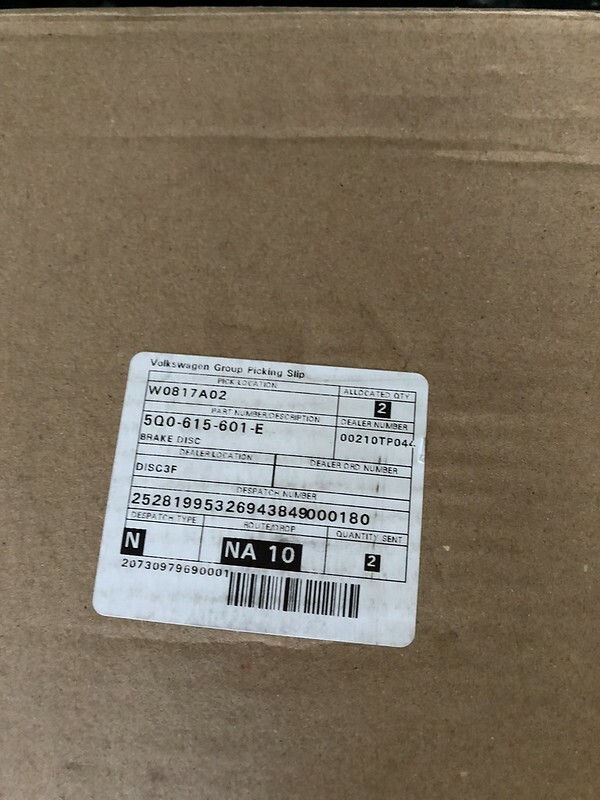 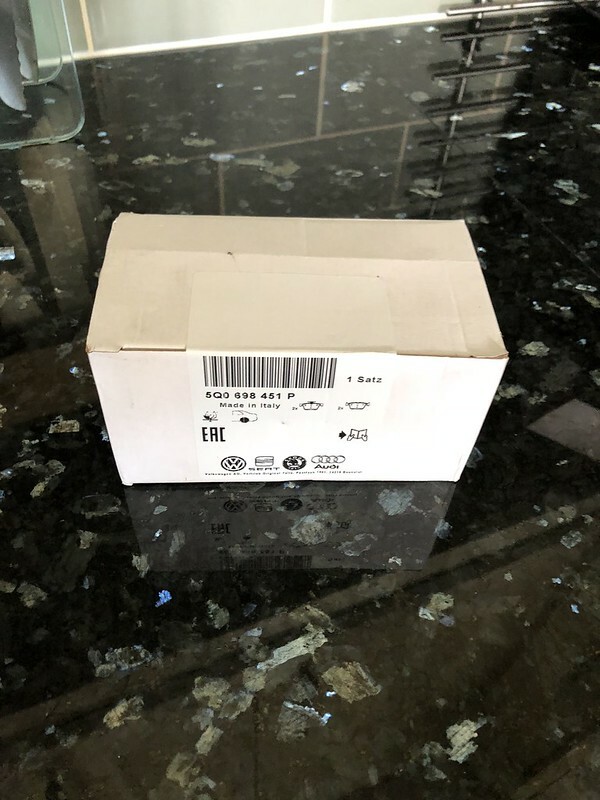 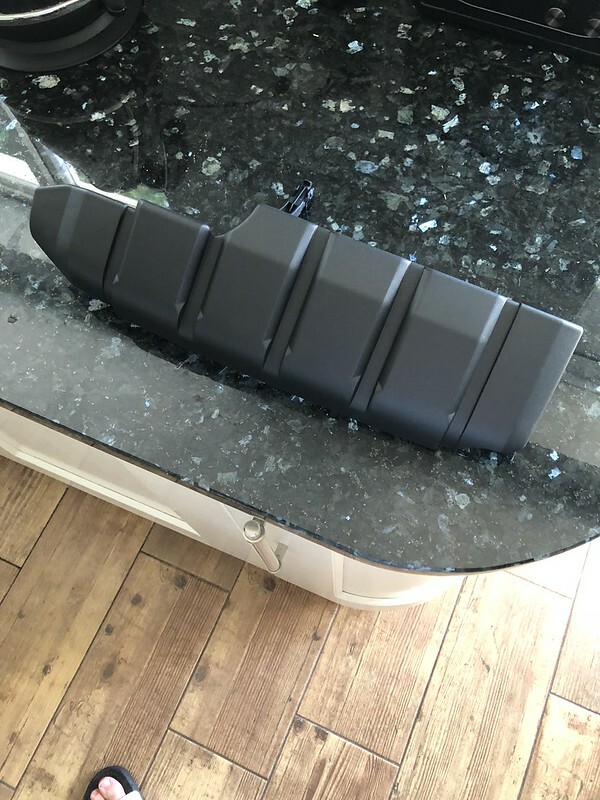 The next part I bought was mentioned earlier in this thread by another member It was already in the plan for the car, was just waiting to go to tps when I needed a few bits to pick one up. 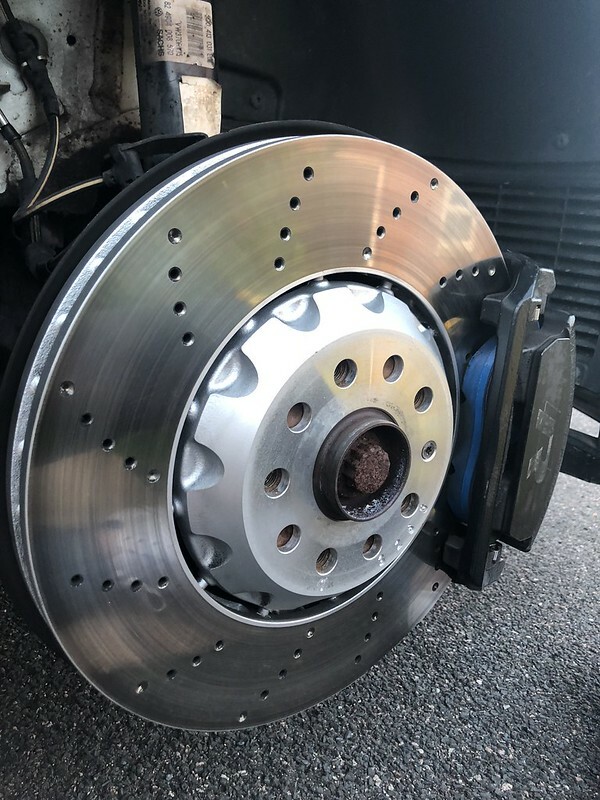 I also picked up a set of rear discs and pads. 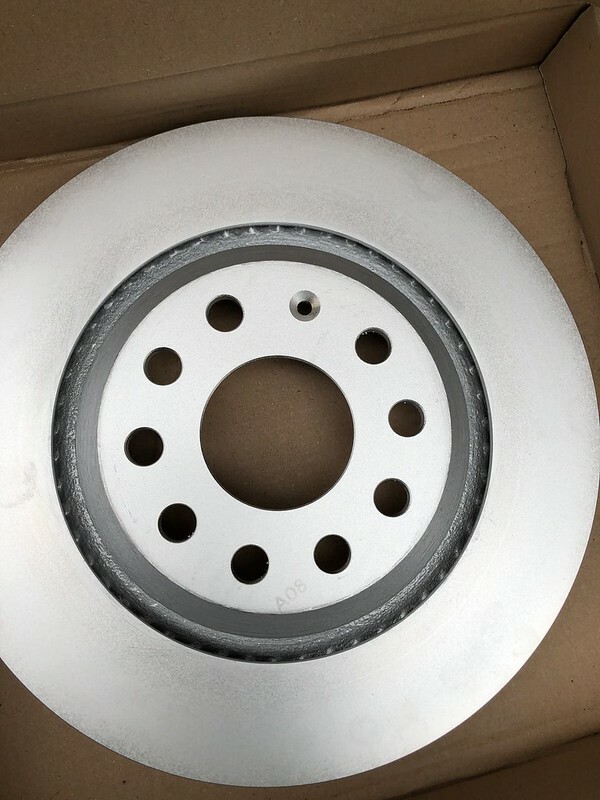 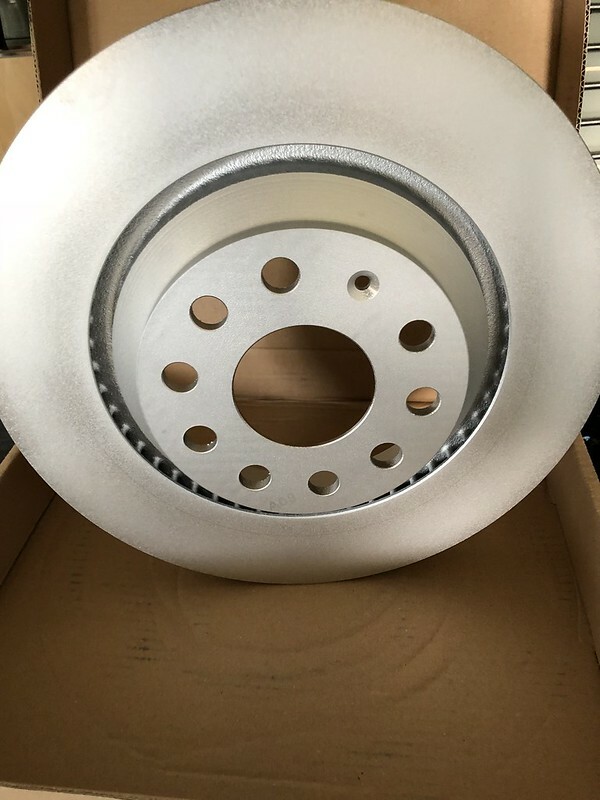 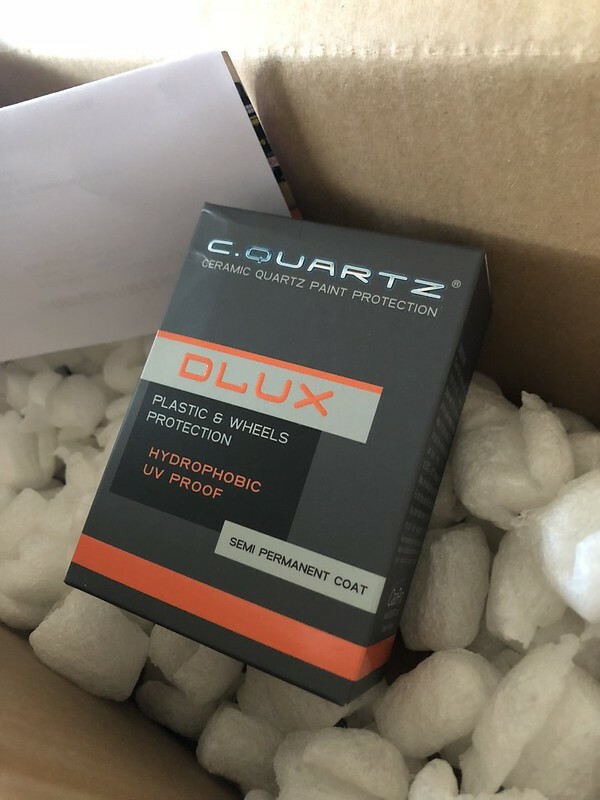 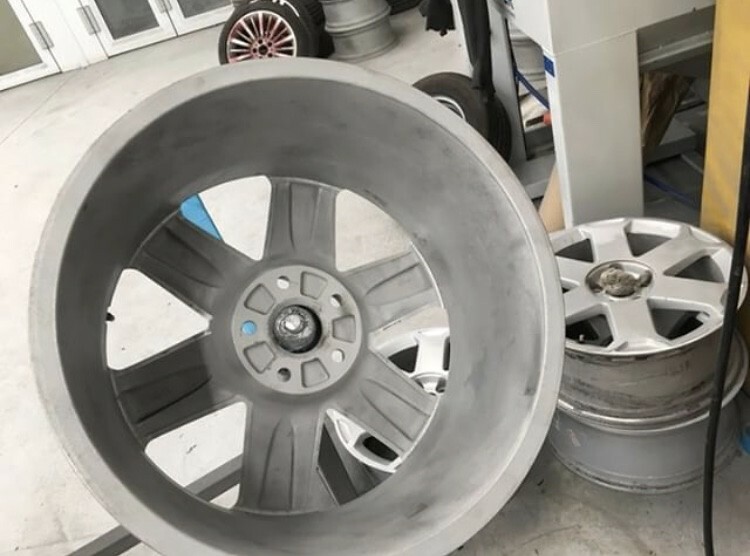 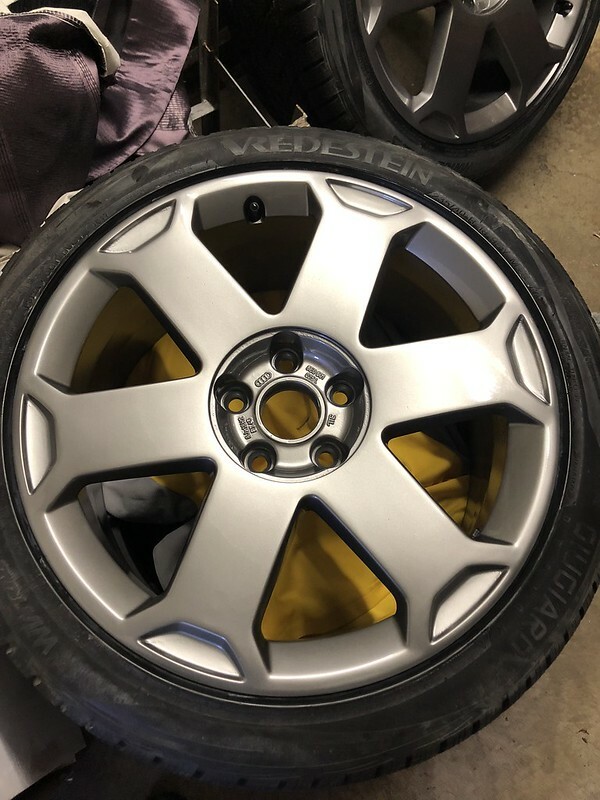 Before I get these fitted I think I will paint the hubs with Hammerite smooth to stop the dreaded rust happening again. 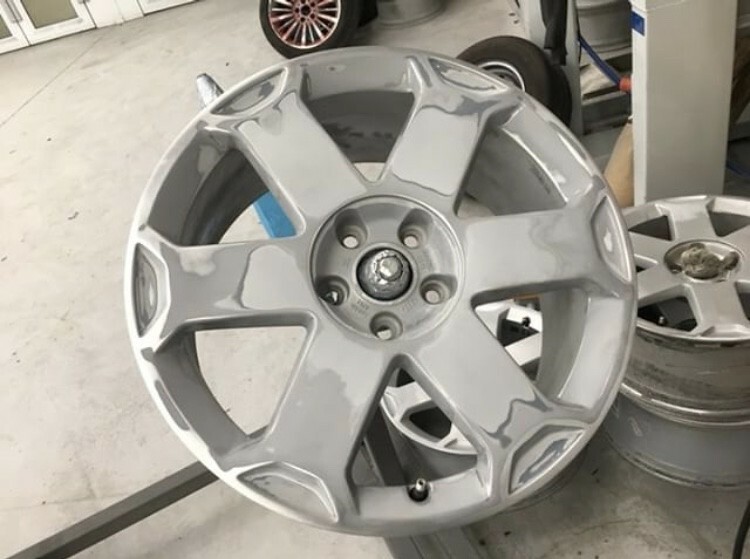 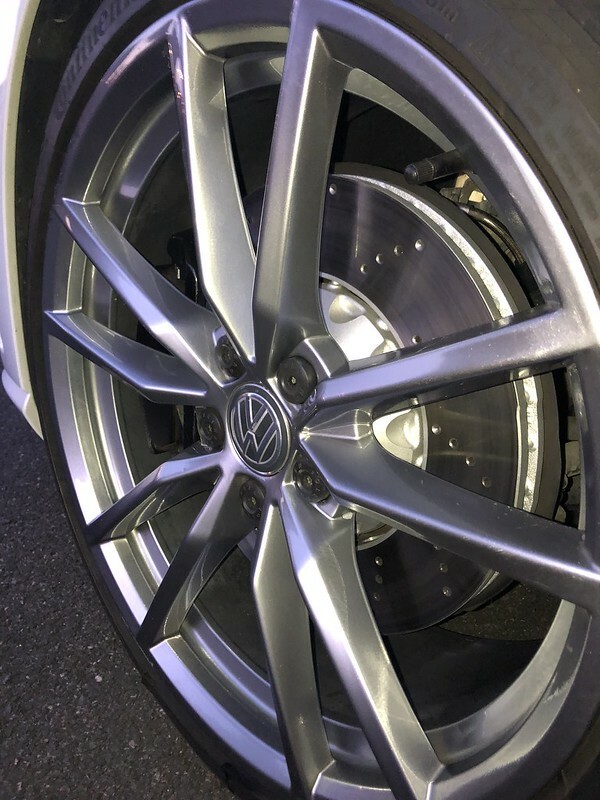 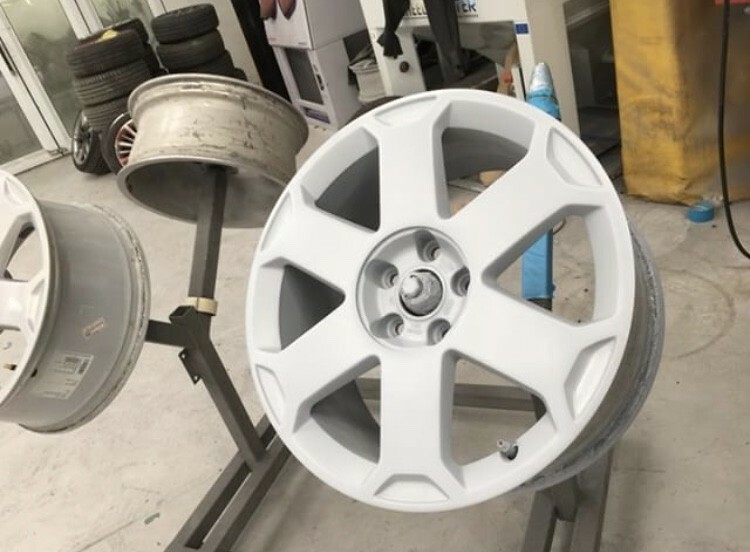 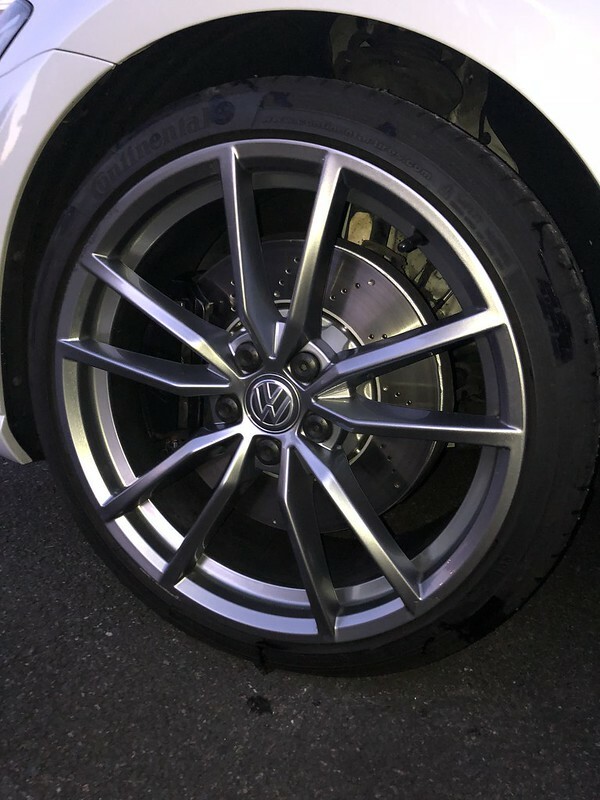 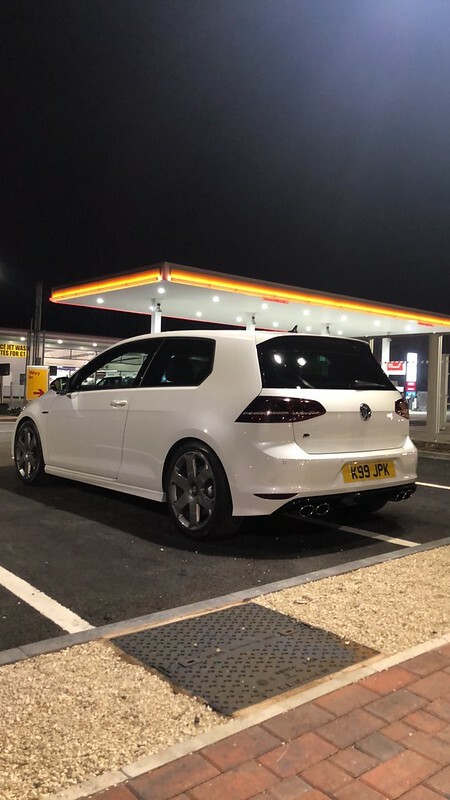 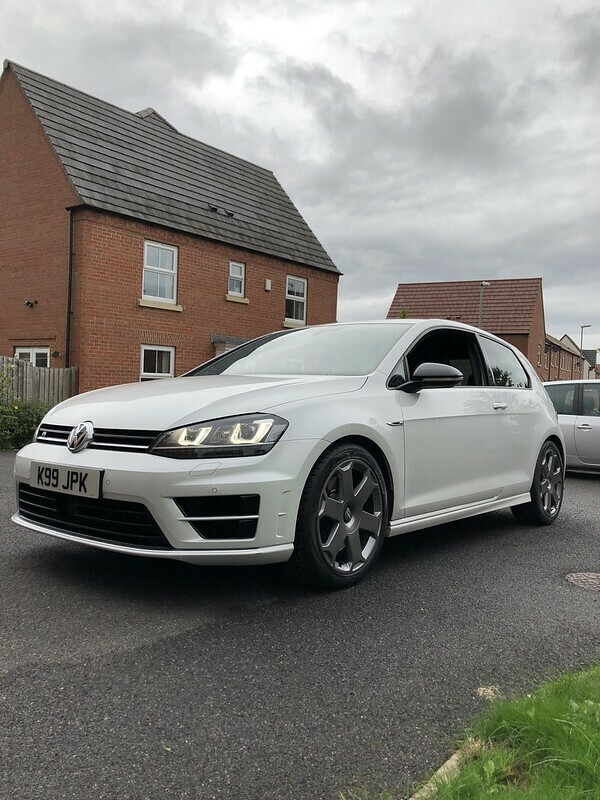 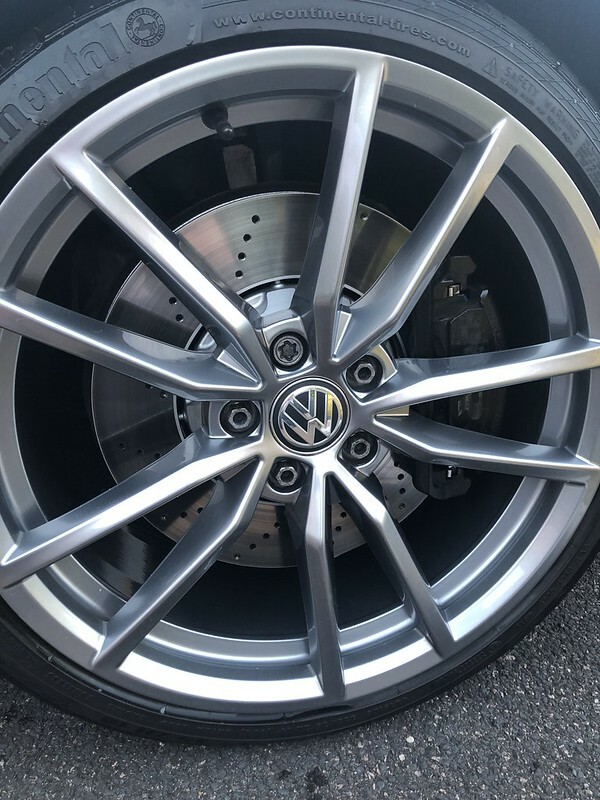 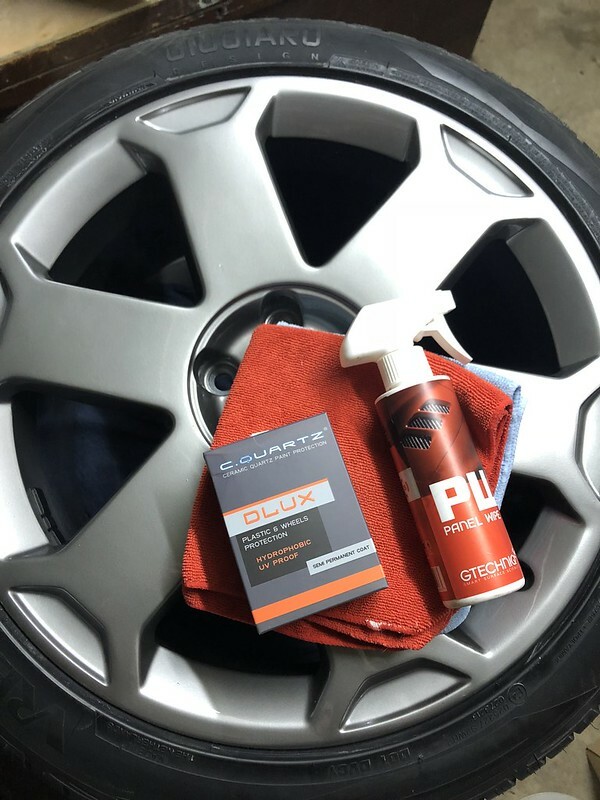 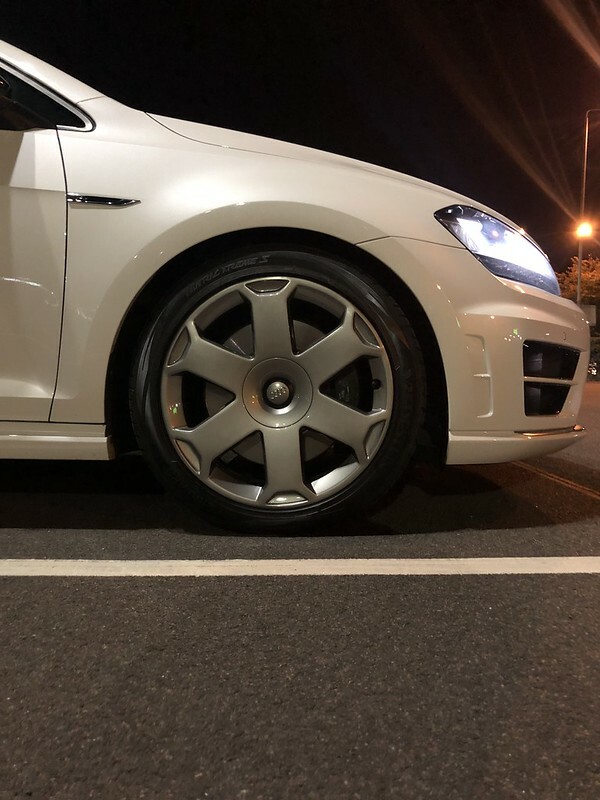 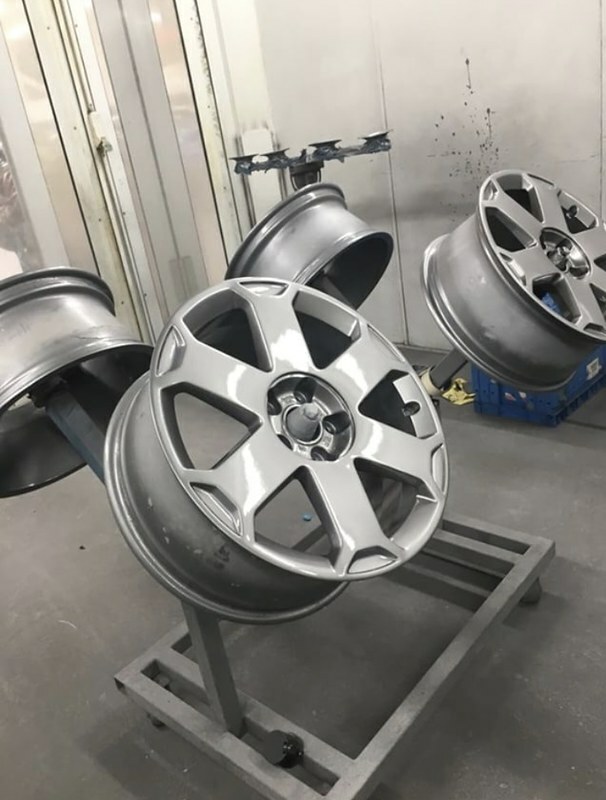 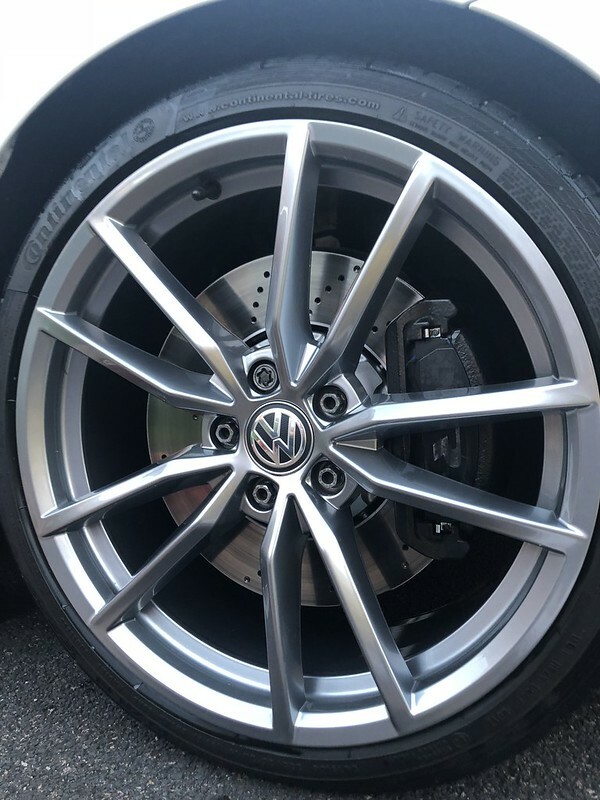 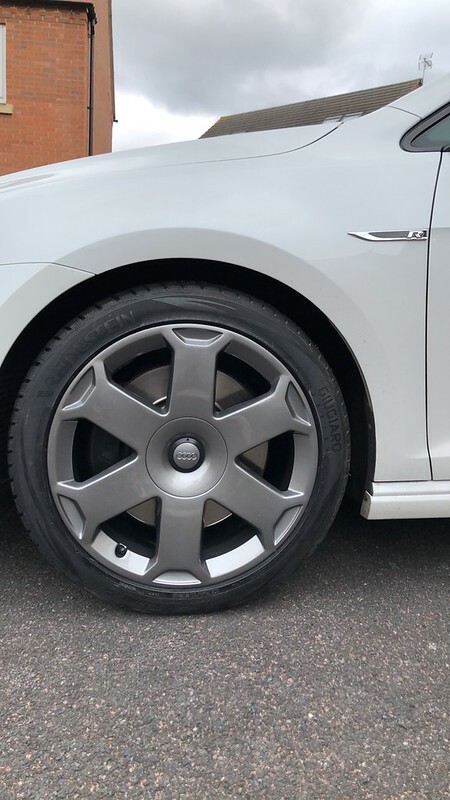 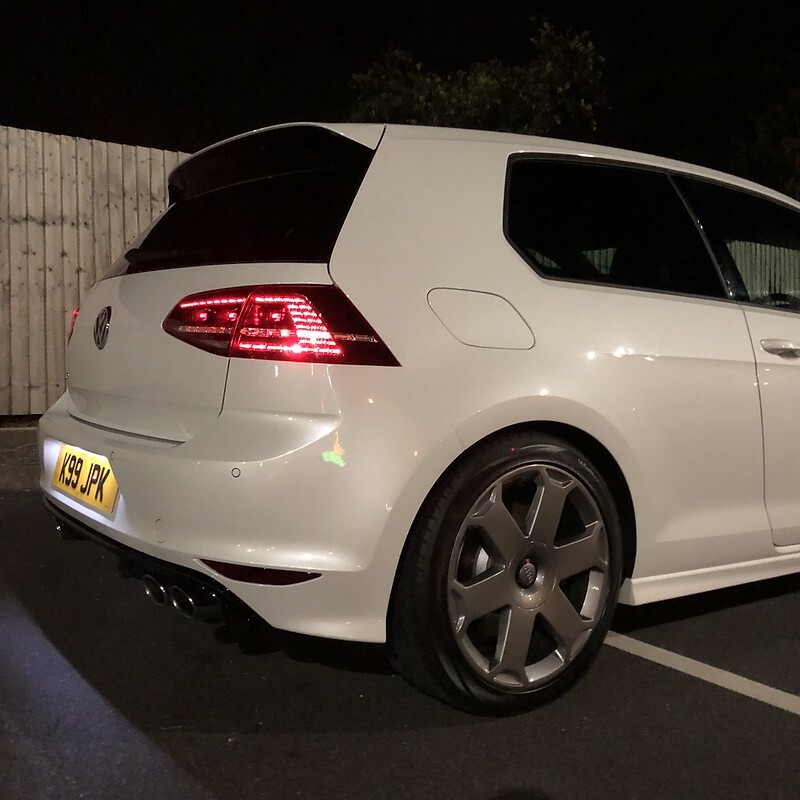 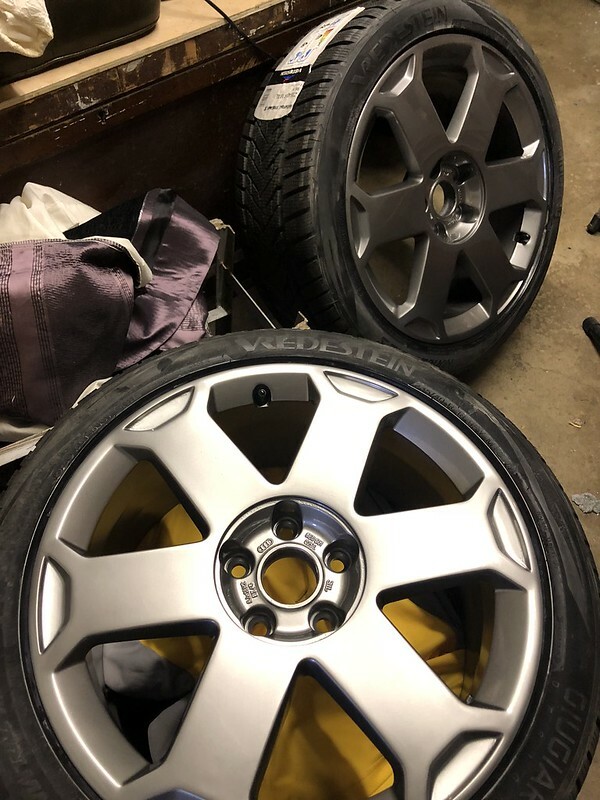 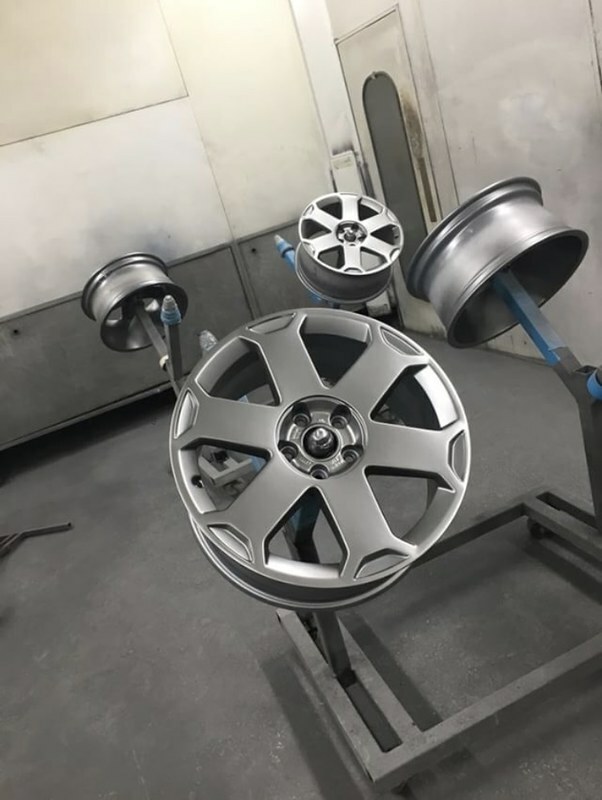 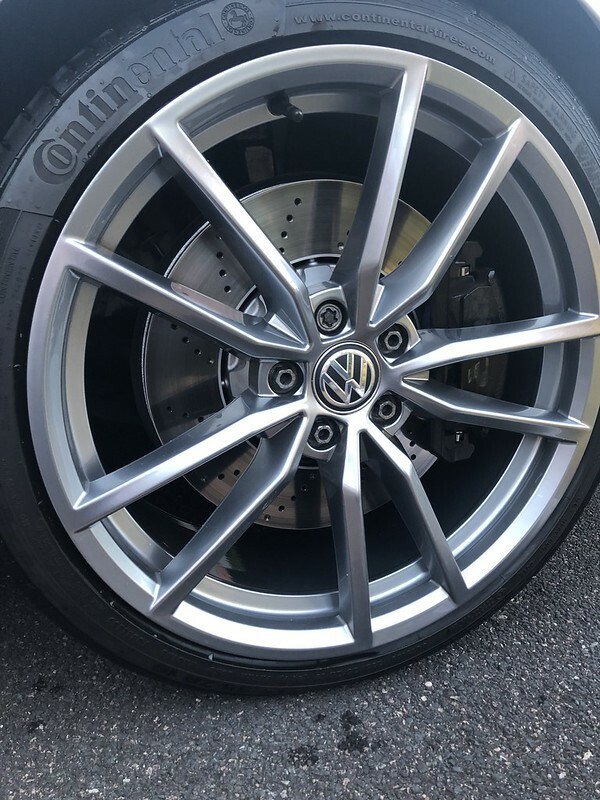 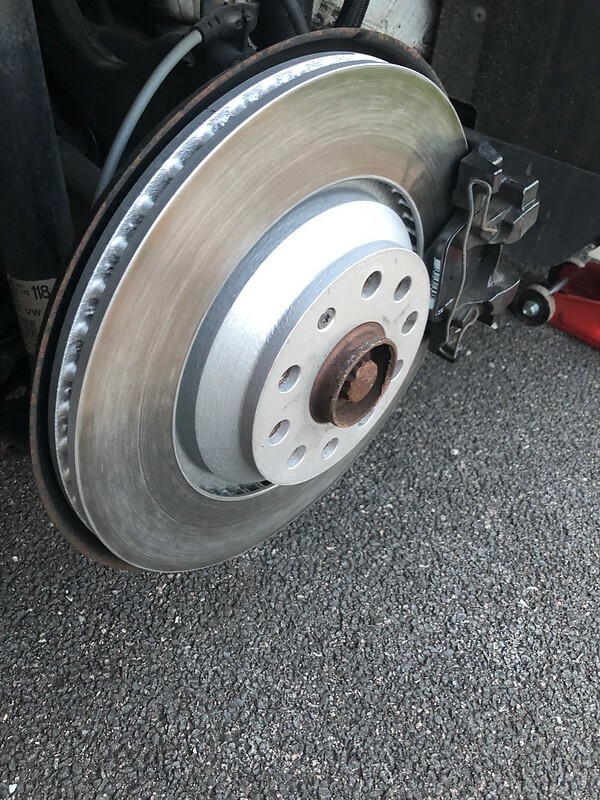 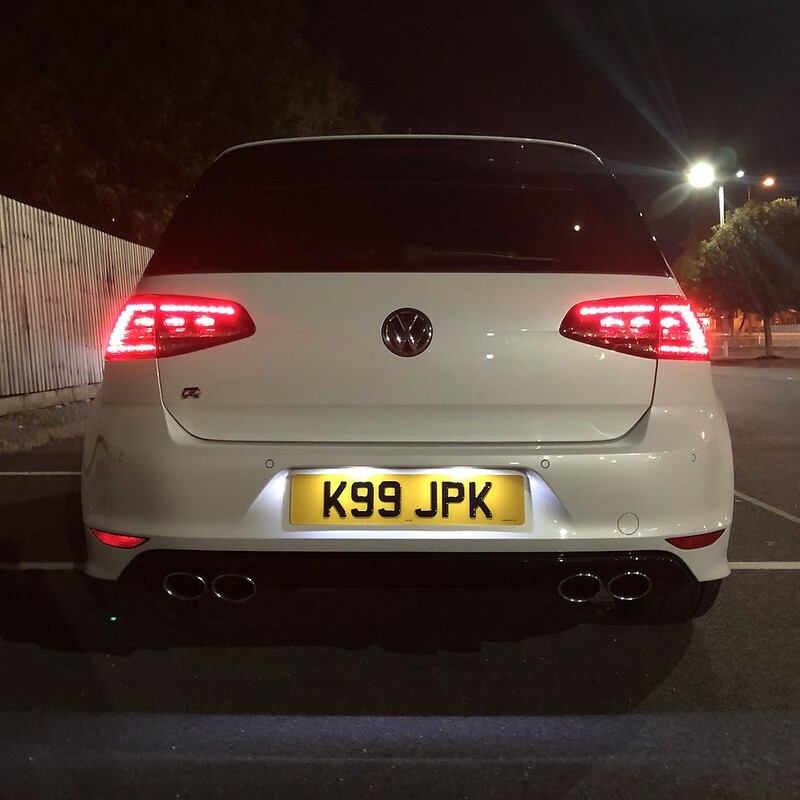 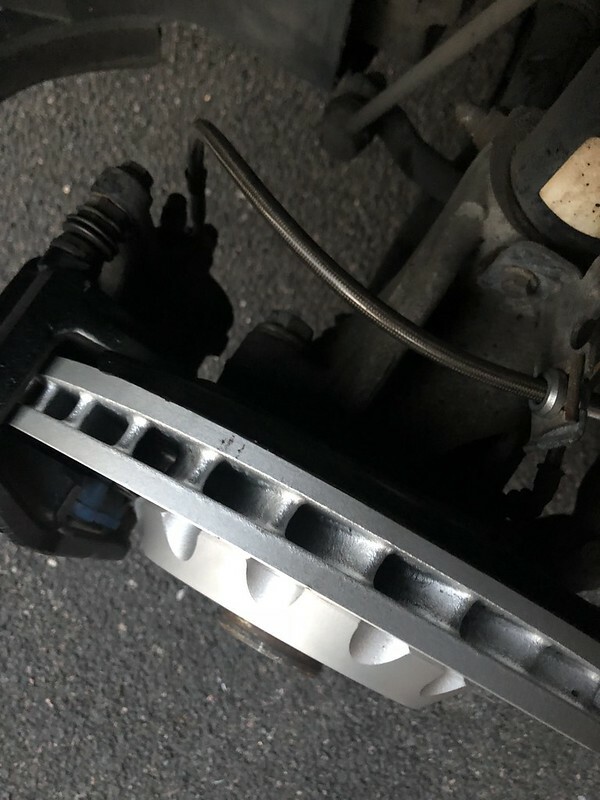 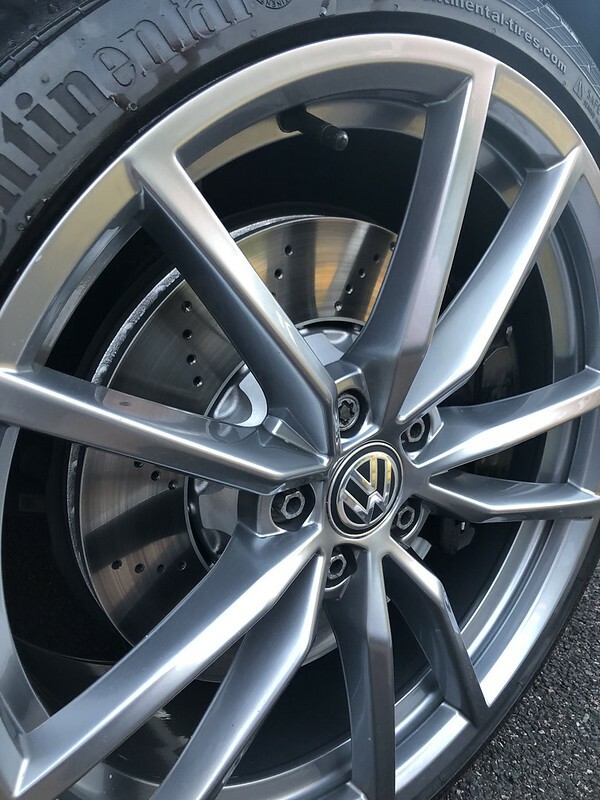 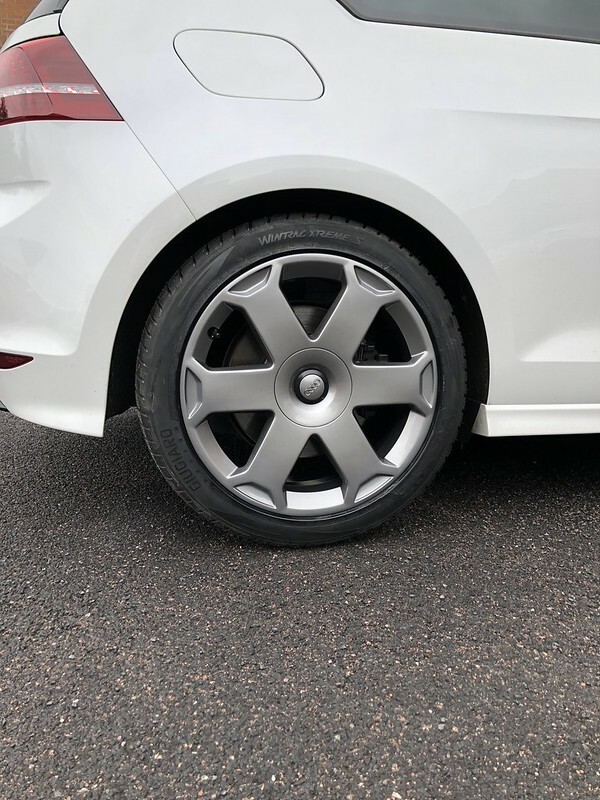 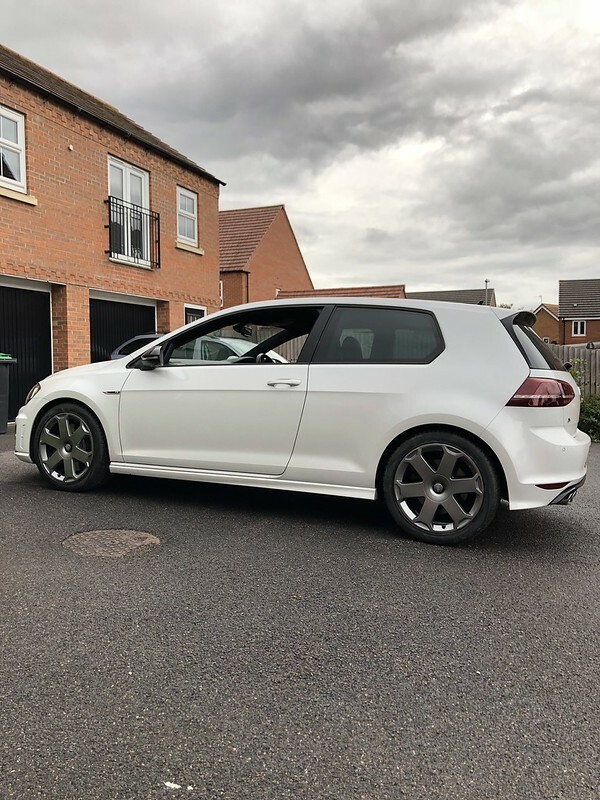 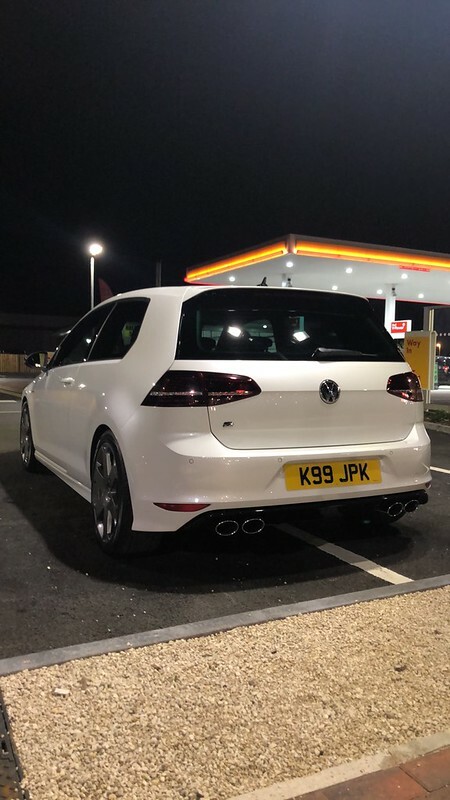 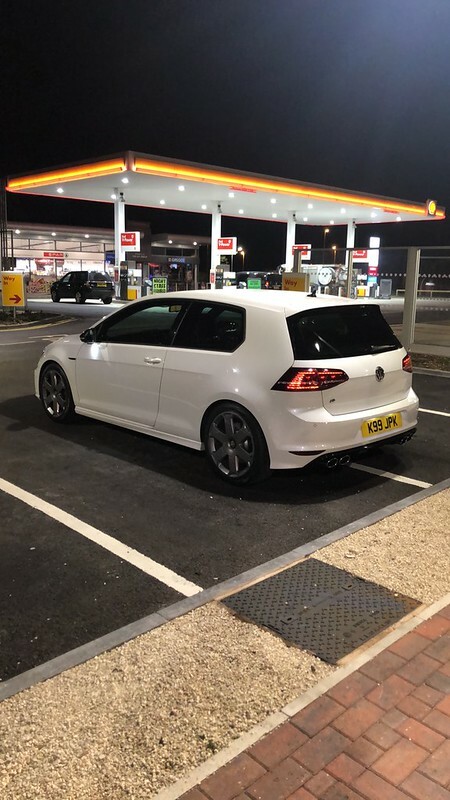 Had a couple of pictures sent to me yesterday of the wheels, the lad who is doing them for me works for BMW doing alloys and does his own work in his own time before and after work. 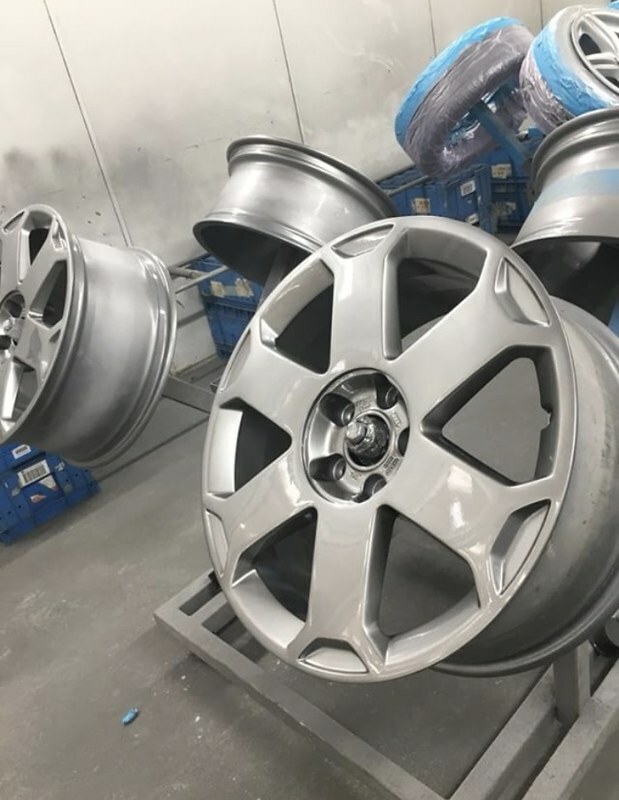 They are being done in Ferric Grey. 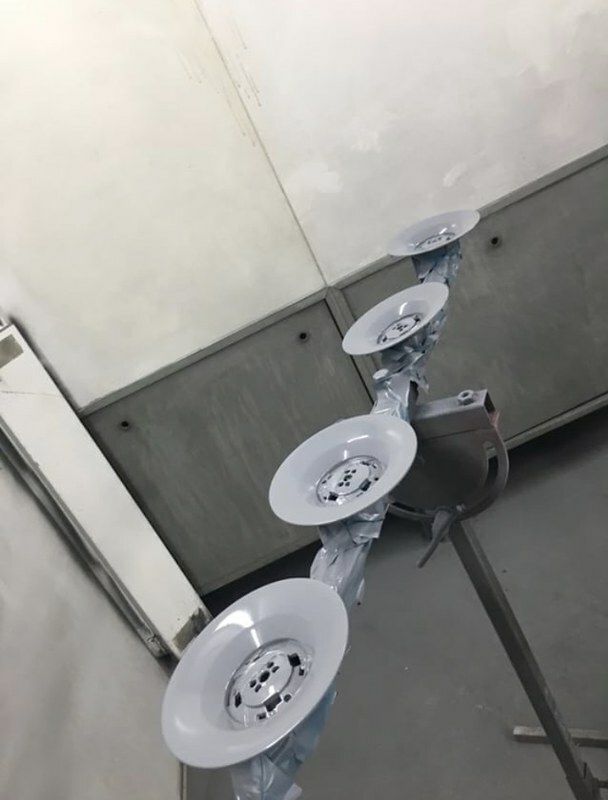 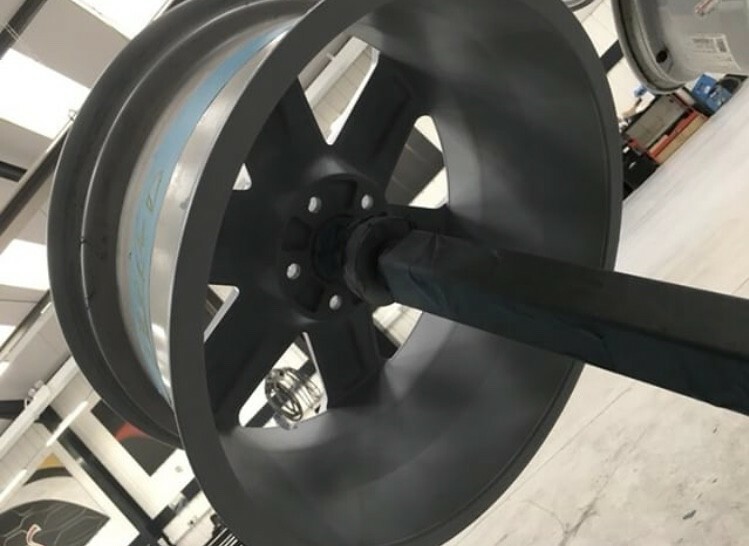 I had my disc hubs powdercoated radially around the disc hub and the edges of the disc. 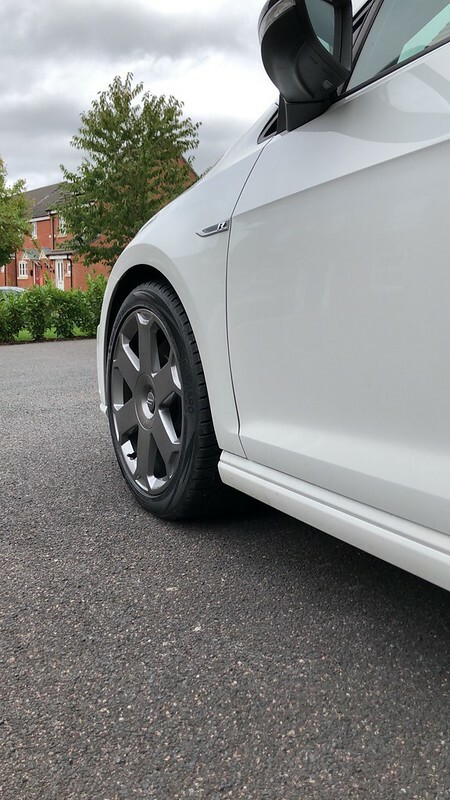 Nearly a year on them and still looking great. 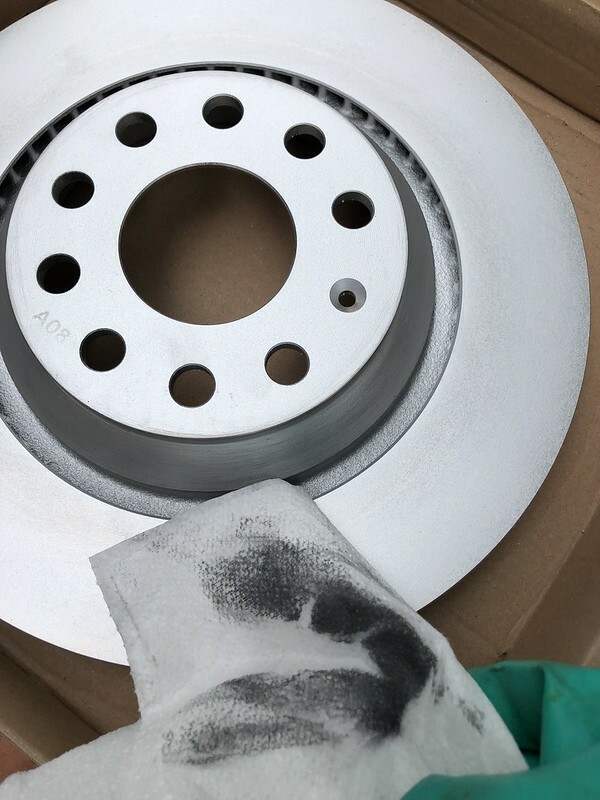 A good VHT with an etch primer first will be fine too though. 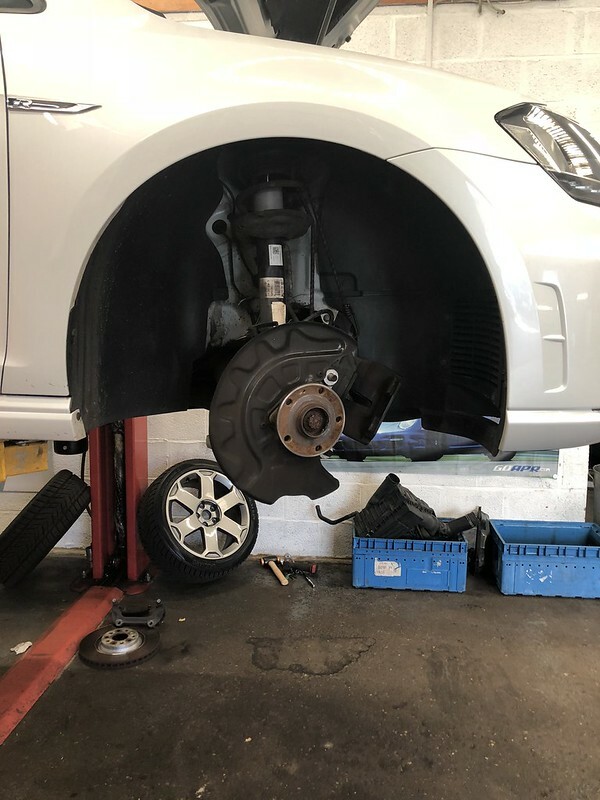 Nothing worse than rusty brake hubs. 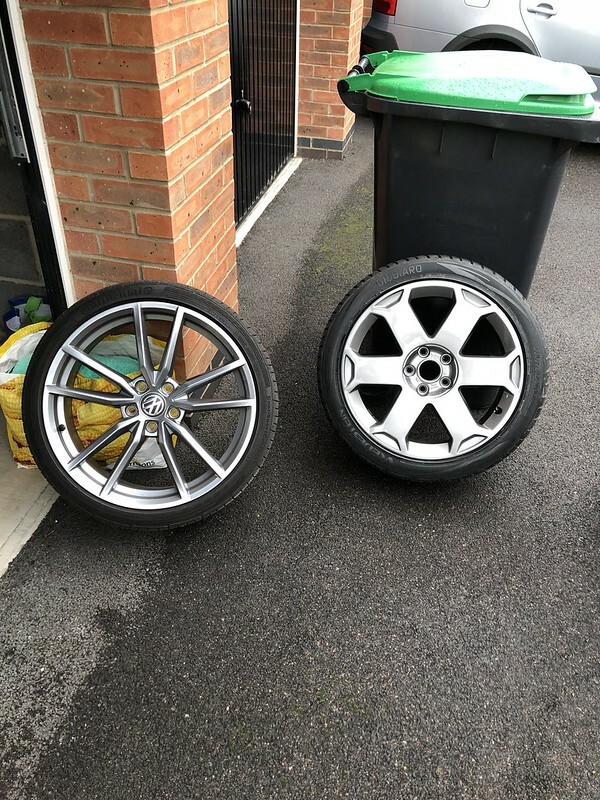 So I have managed to sort out my rear discs prior to their fitment on the 28th. 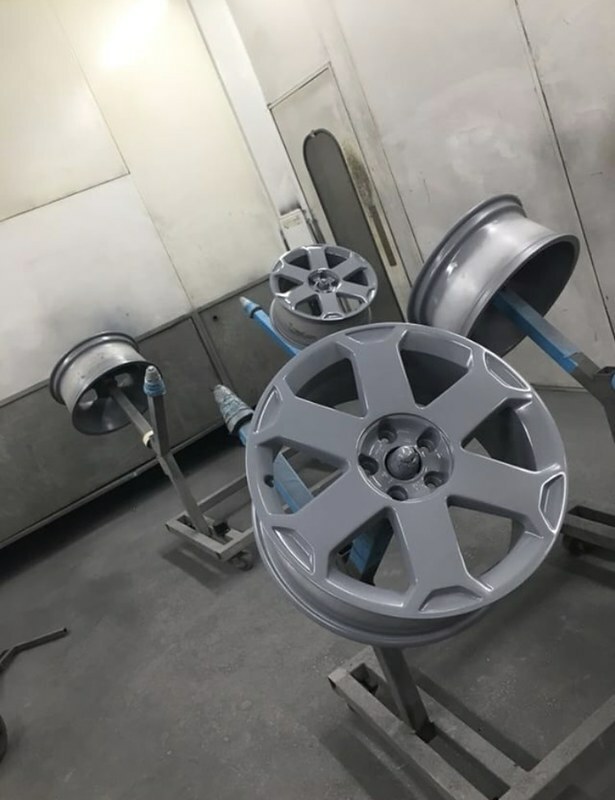 Went a bit overkill and gave them 4 coats as I had a bit of spare time and was finishing the can of Hammerite off. 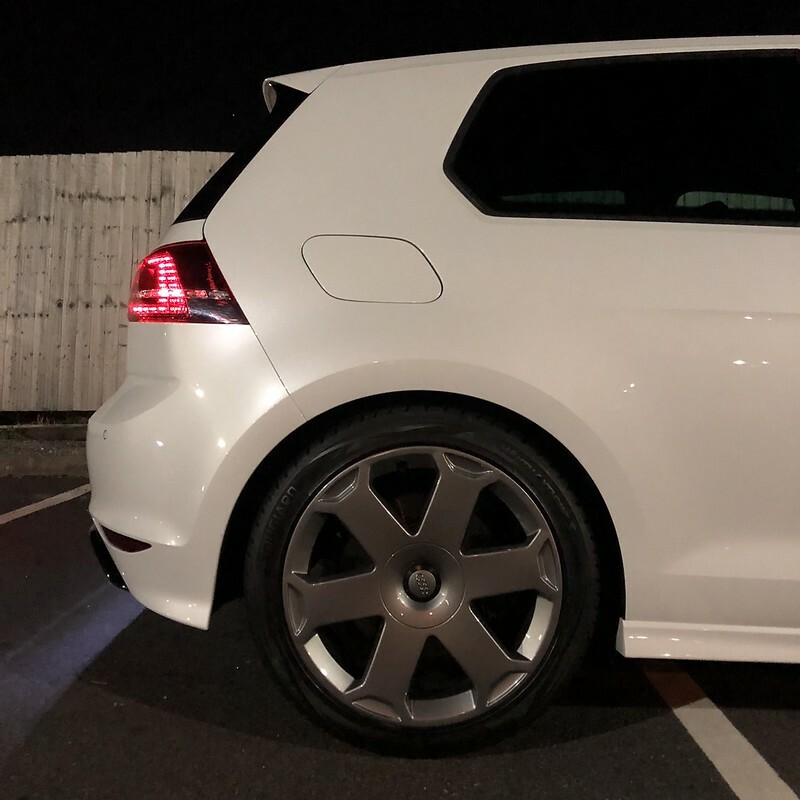 Will get some more pictures when I put a sealant on, currently thinking of going for DLUX but got a week to decide. 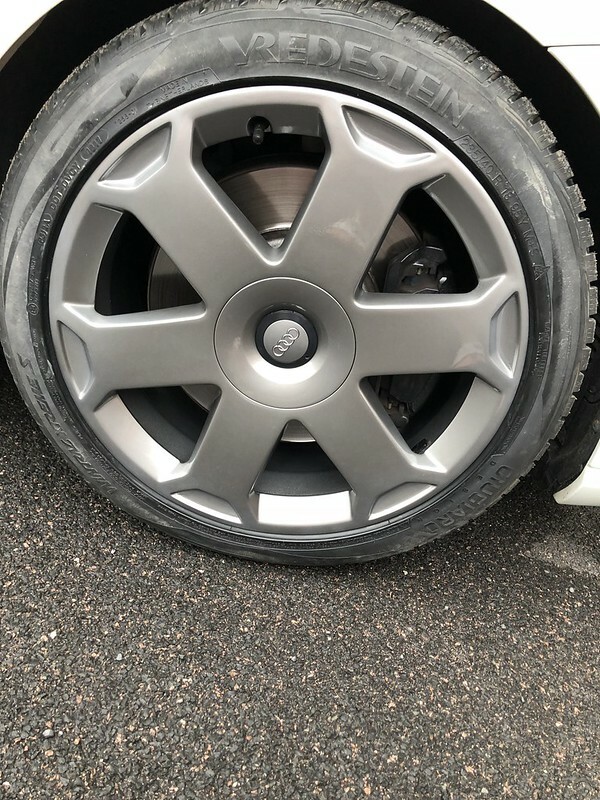 The wheels will then get fitted for the 28th when the MOT is and then come off again and will go on towards the end of October. 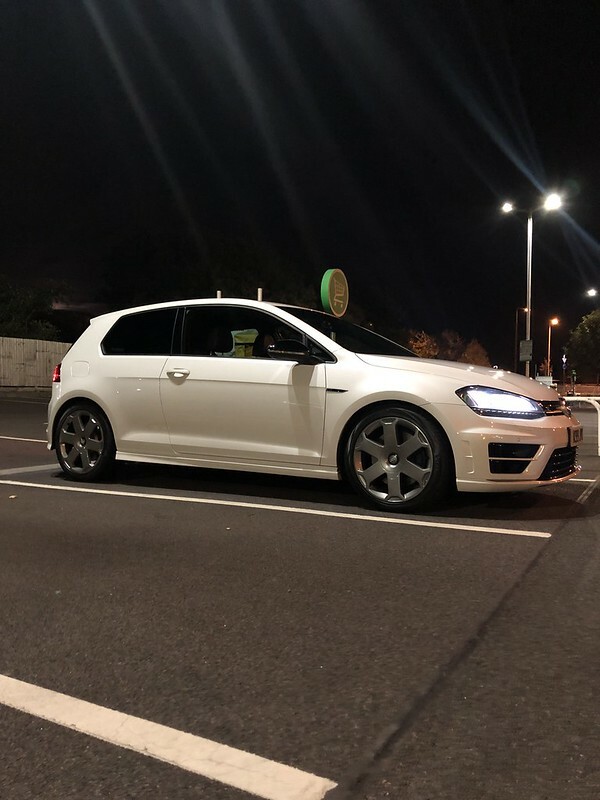 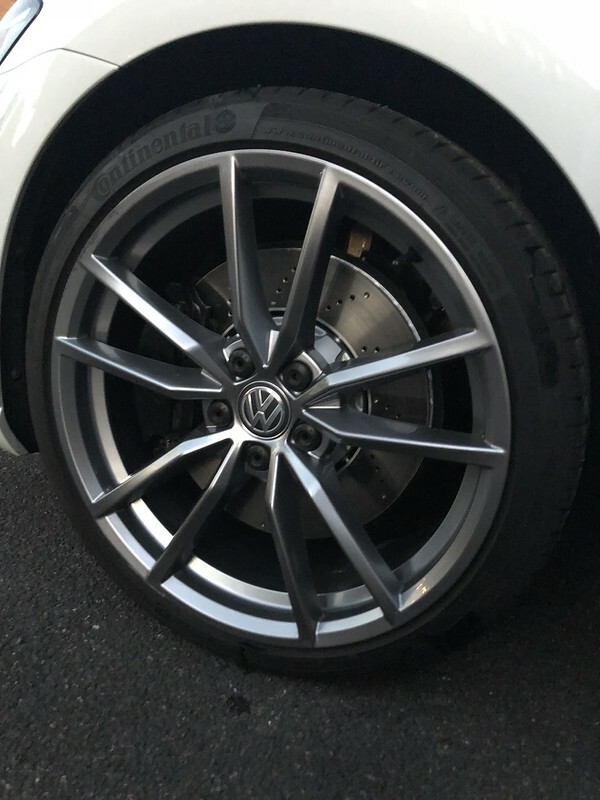 On Sunday I decided to fit the winter wheels for its MOT as the Golf will be in the garage until then anyway. 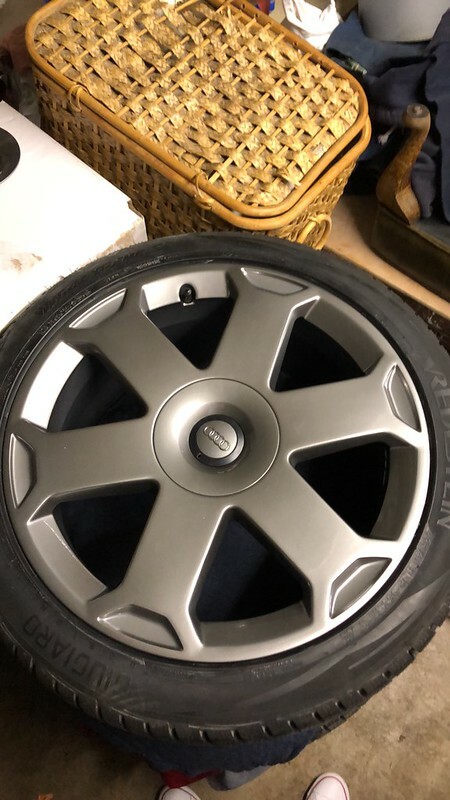 I will then put the pretoria's back on until the weather drops. 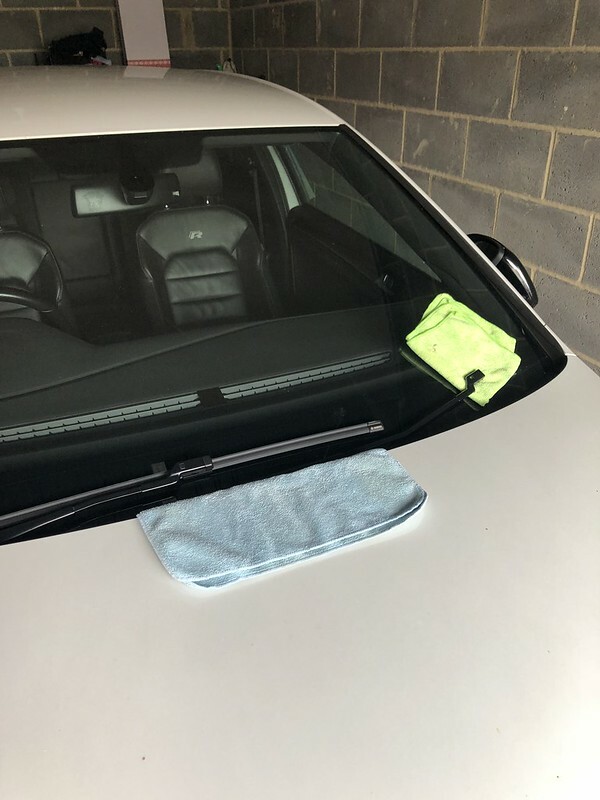 Some more MOT prep yesterday fitting new wipers, mine were ok but thought i'd change them. 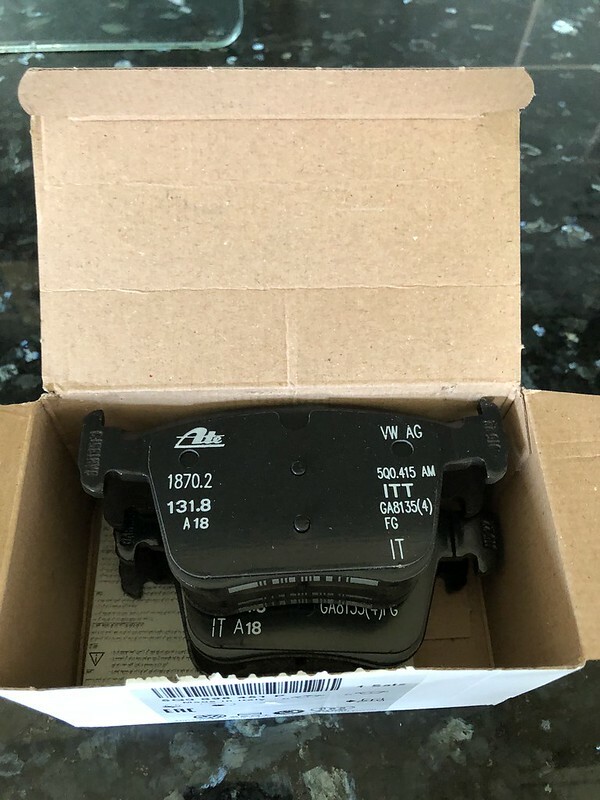 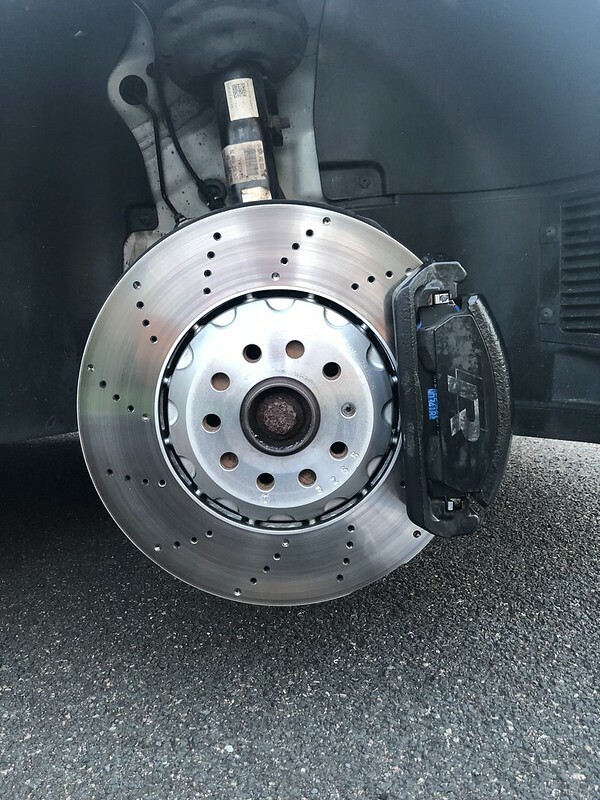 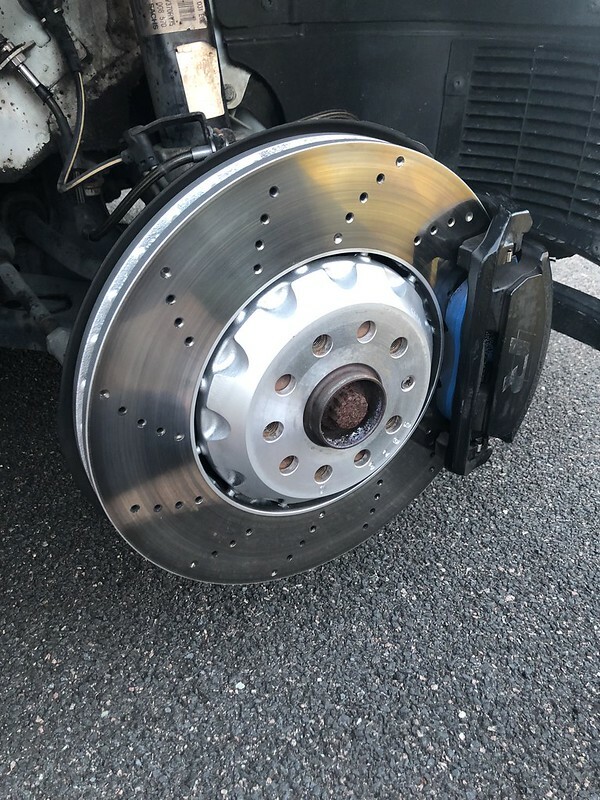 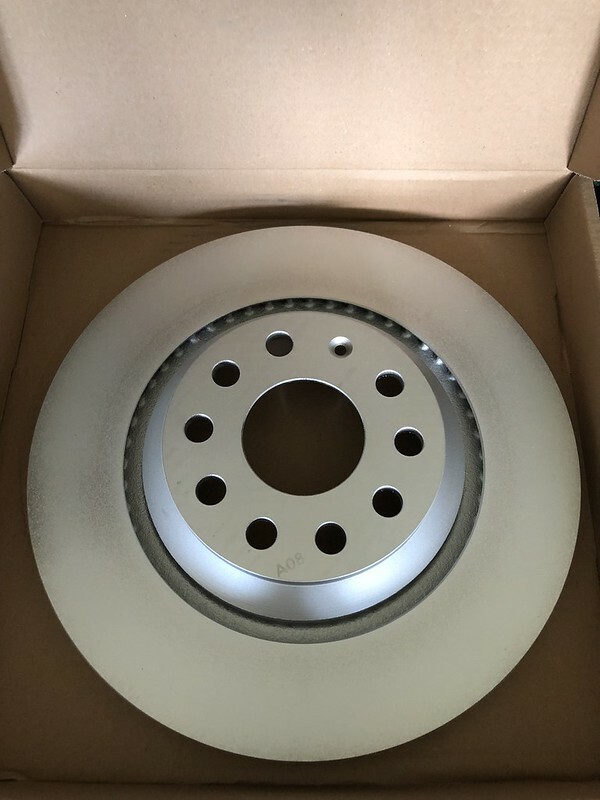 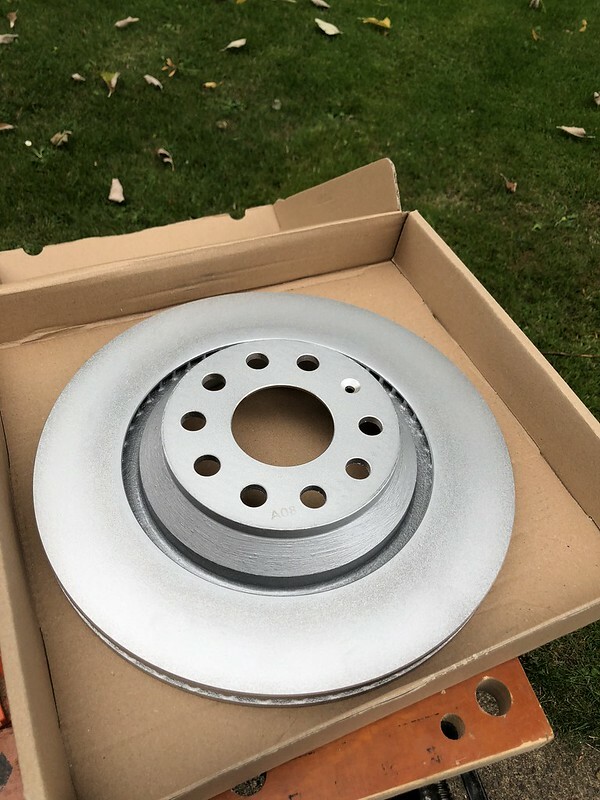 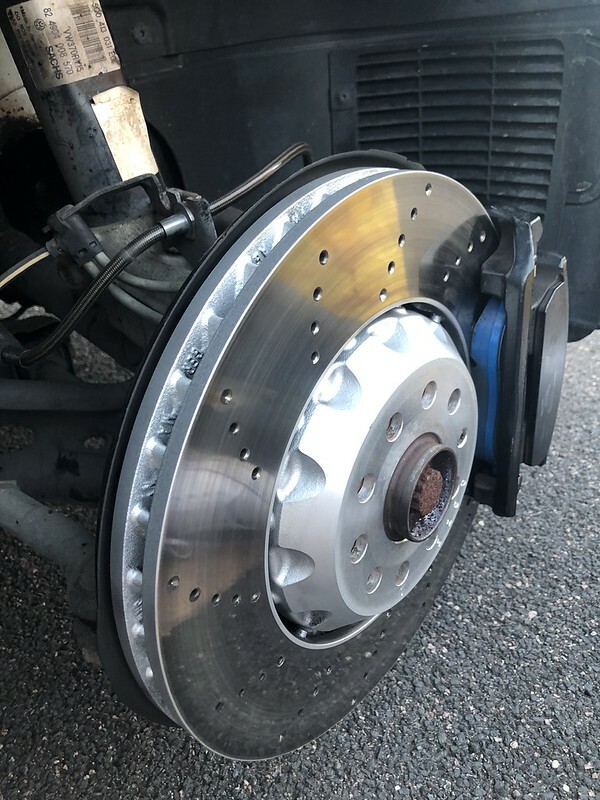 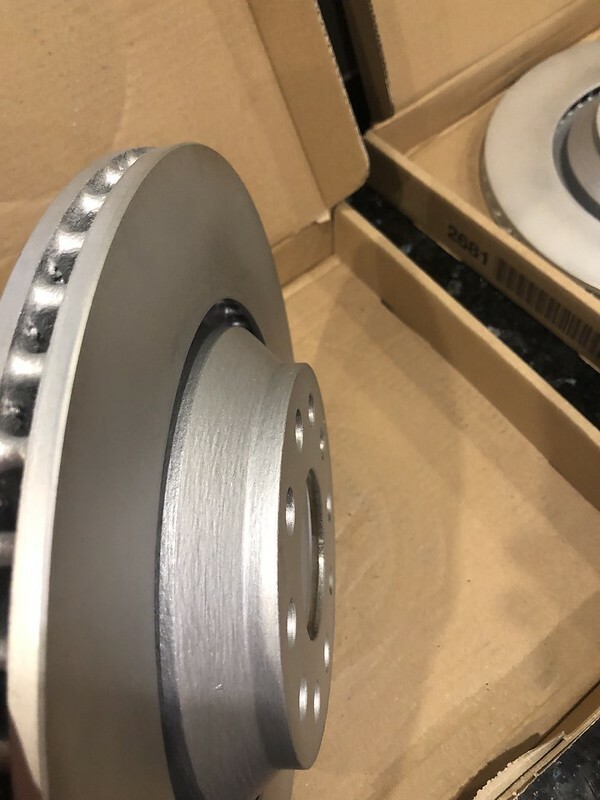 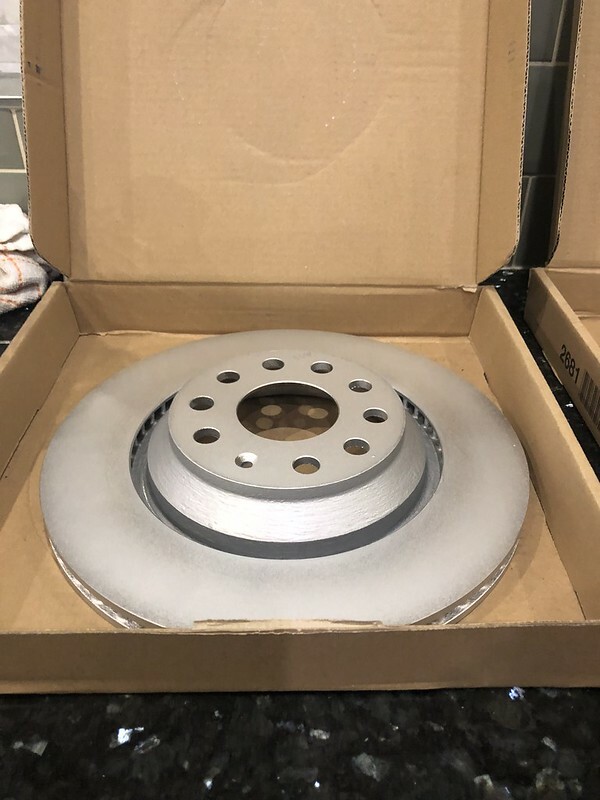 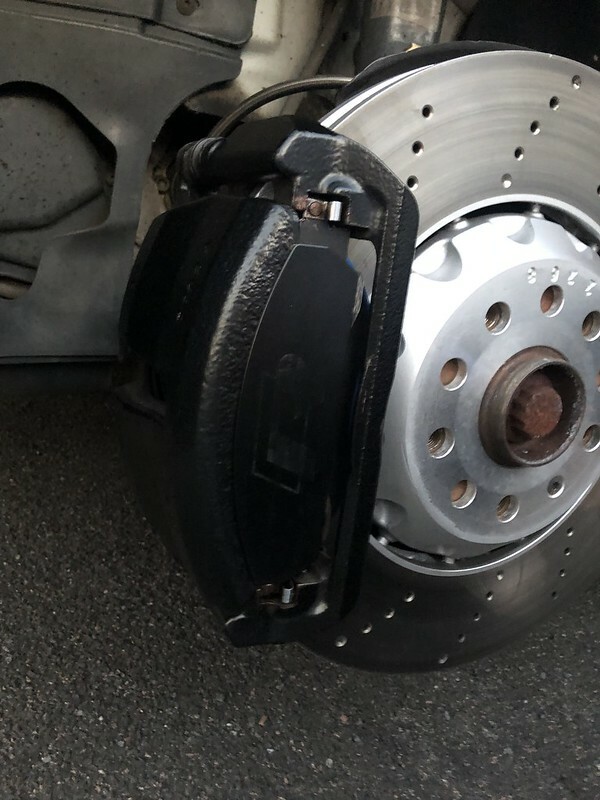 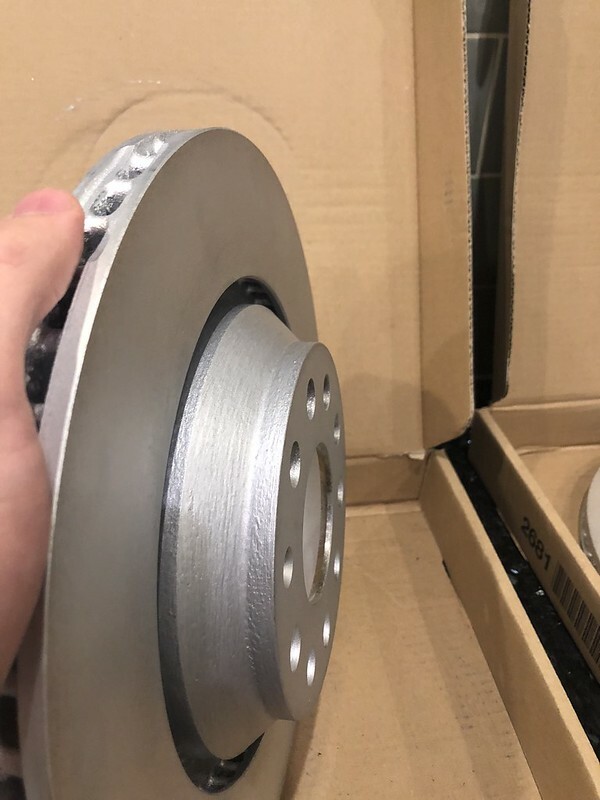 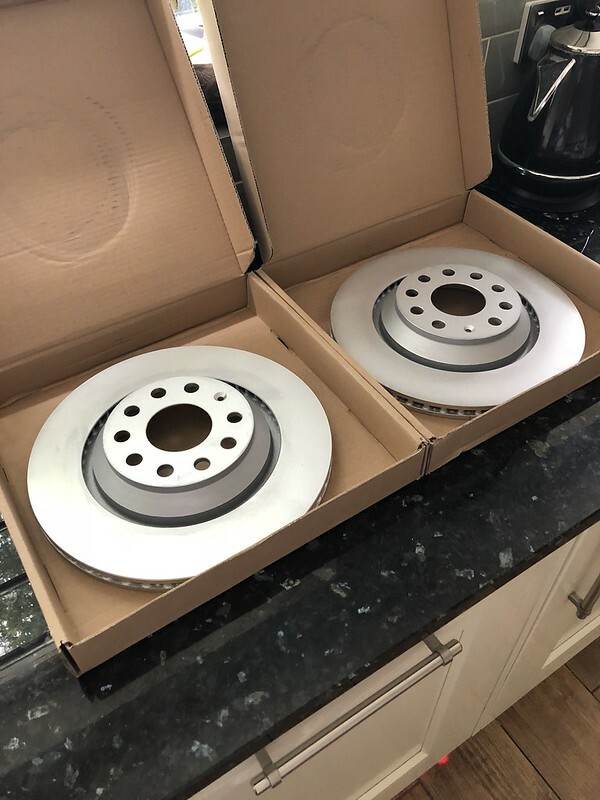 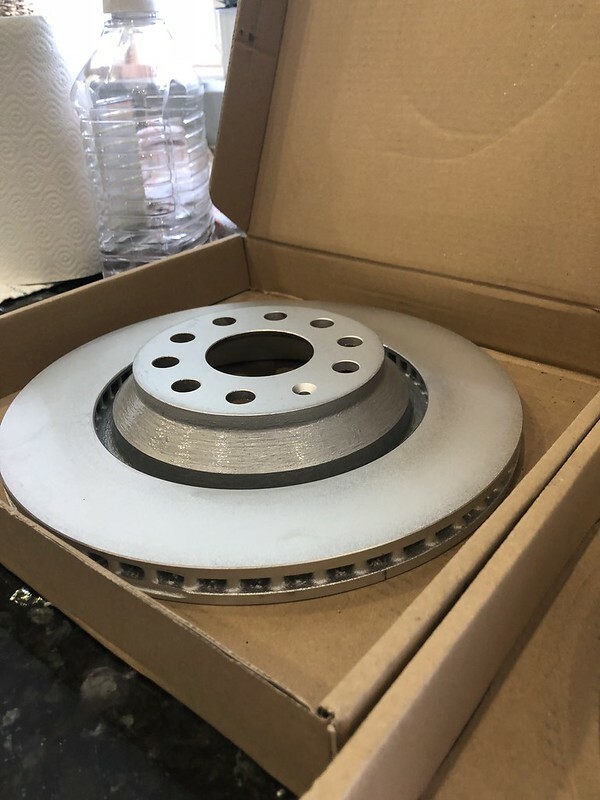 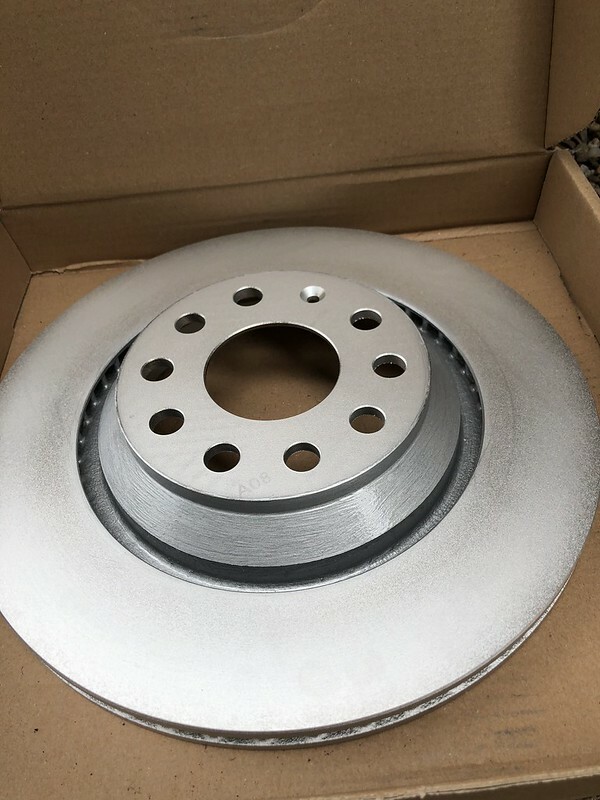 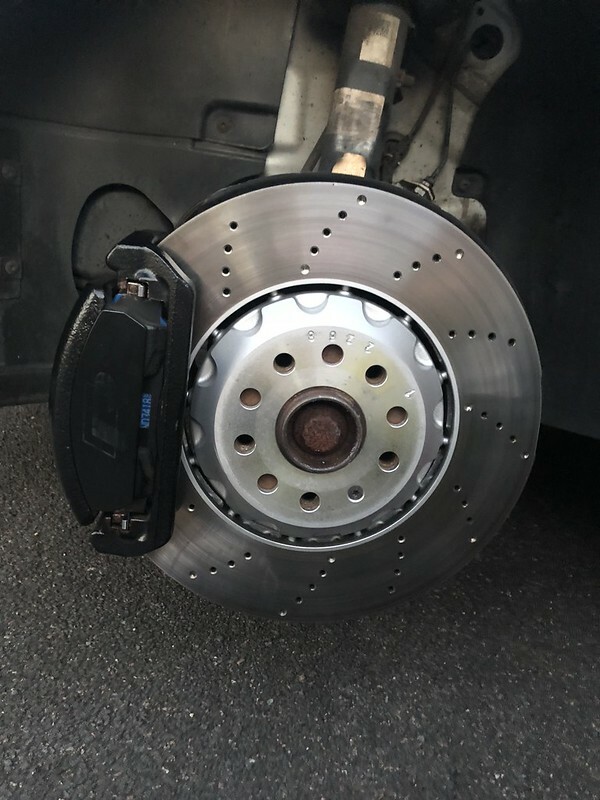 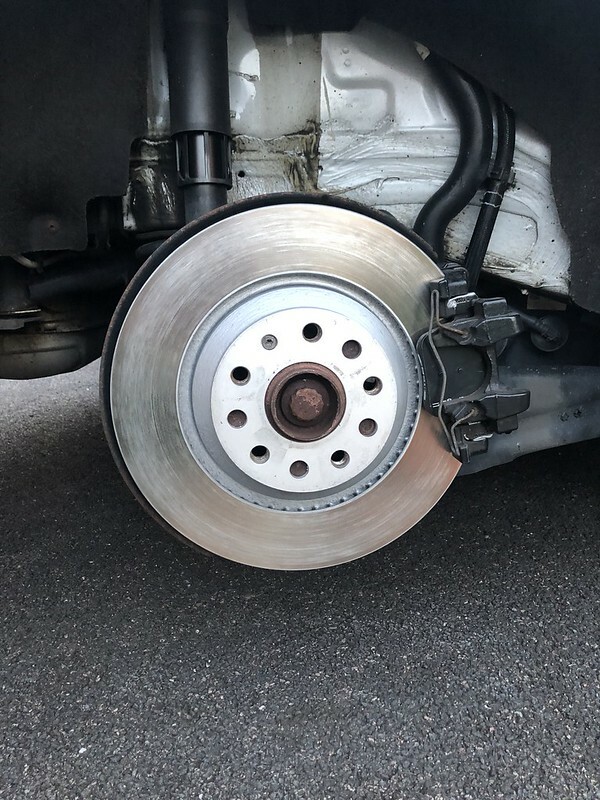 Will get some pictures of the brakes when I get them fitted on Friday. 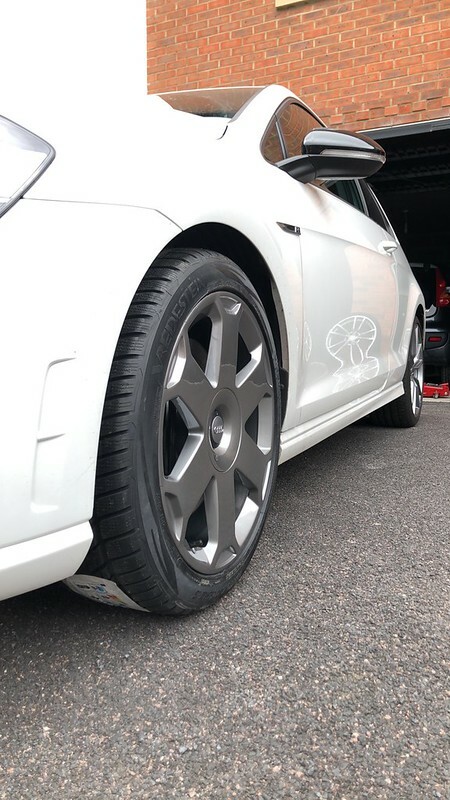 Just need to clean the callipers, have got some new R decals to go on. 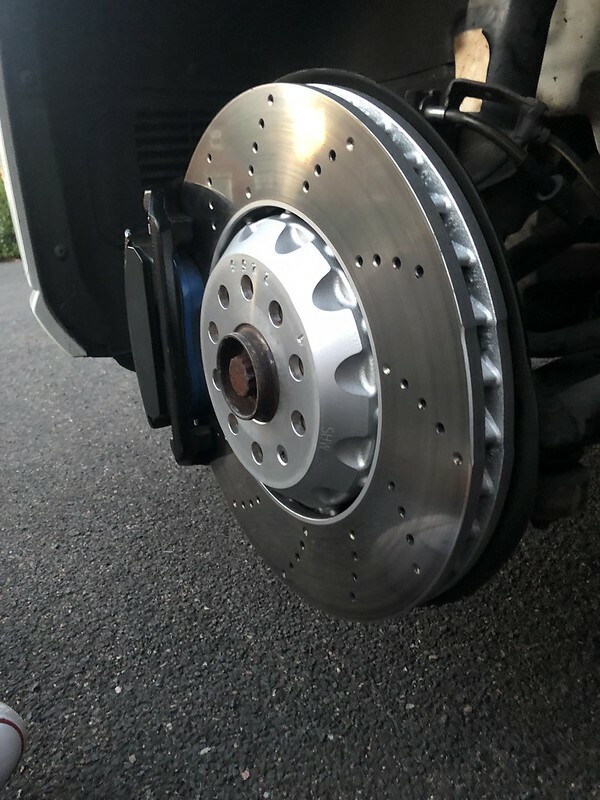 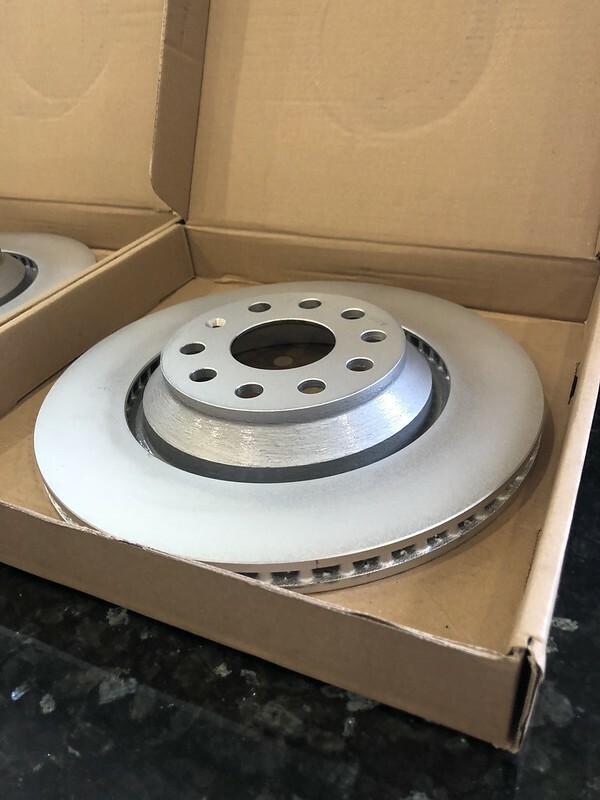 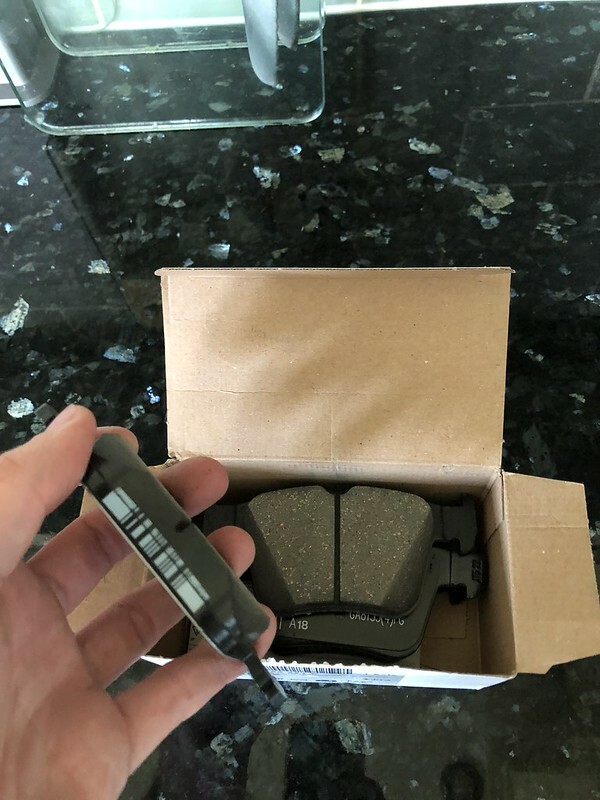 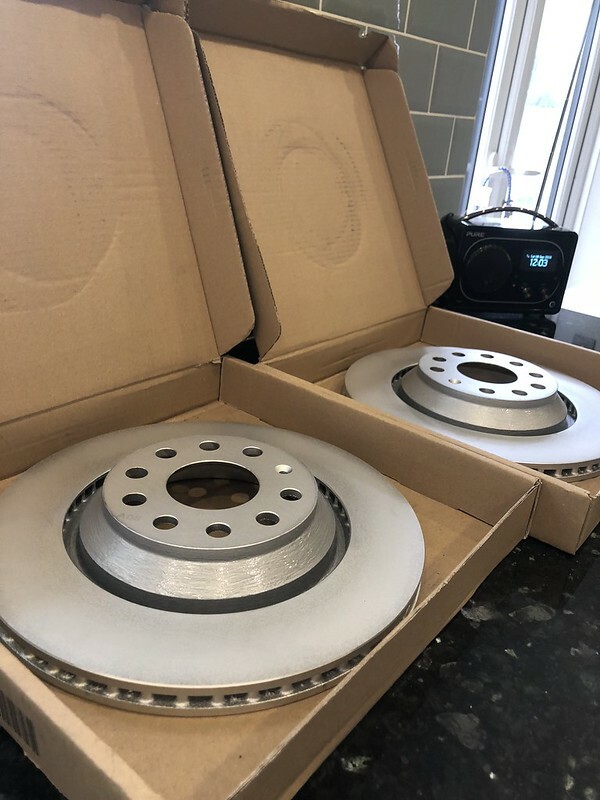 Blue pads instead of the ds2500's as they've had plenty of feedback about them rattling so we decided to go for these instead. 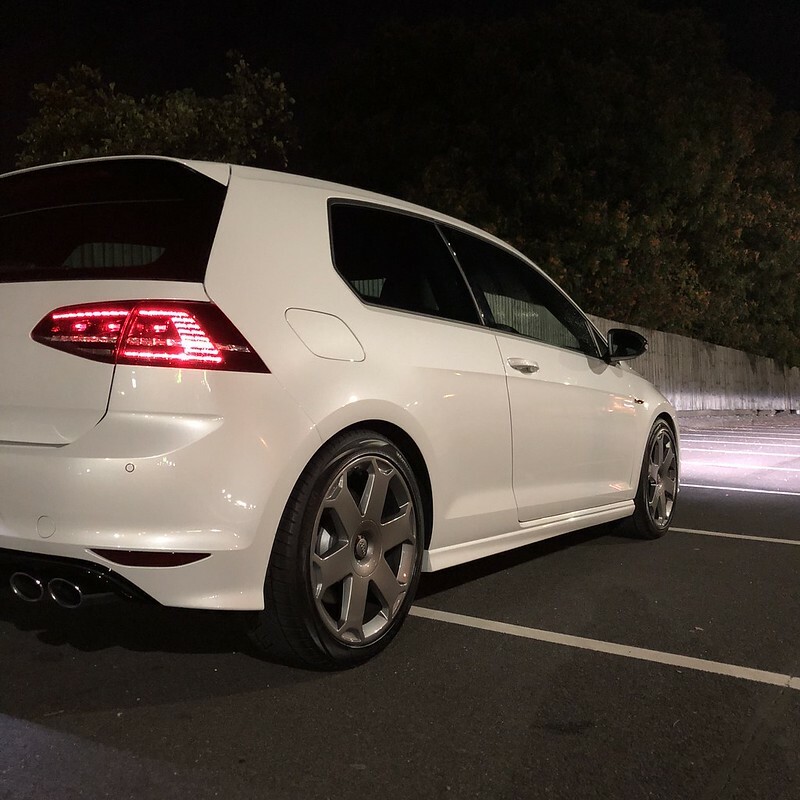 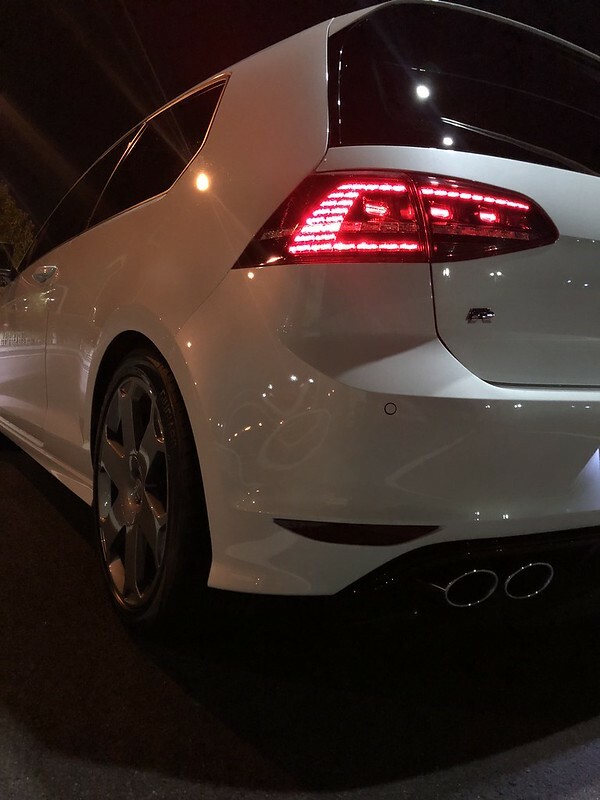 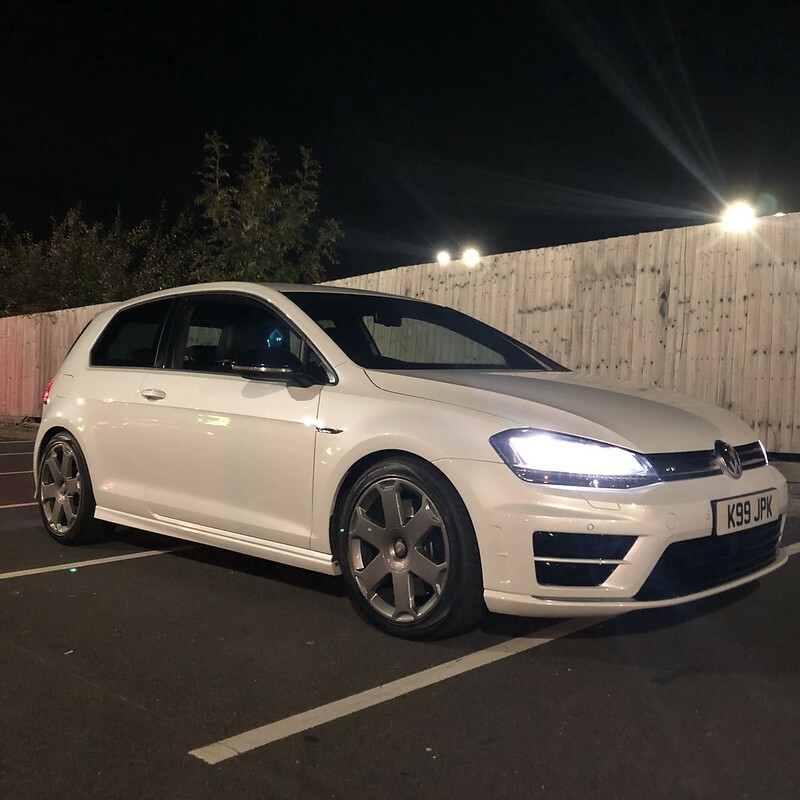 Winter wheels really suit it! 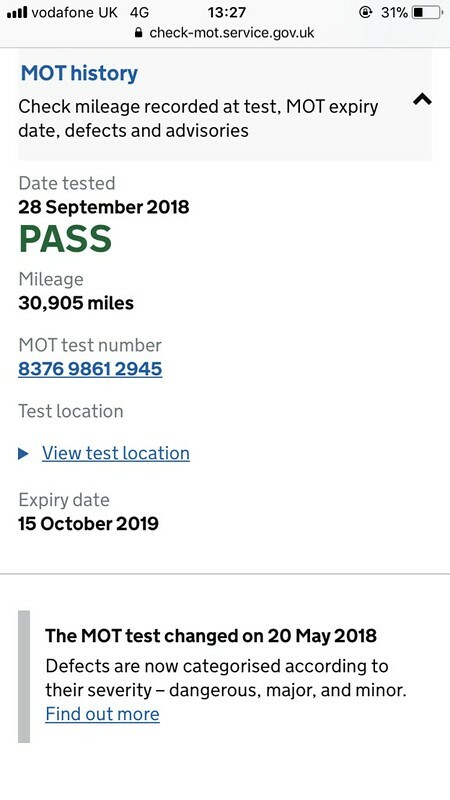 Had my first MOT too last month.